How to block blue light? How much Blue light software Blue light filters block? Blue light is just blue light. Yes, it’s the most high-energy wavelength of the visible light but we have it everywhere around us. Even if you place blue LED in front of your eye you are not going to be blind in a couple of seconds but still, prolong exposure to blue light may cause permanent damage in the long run. I’m not going to go into details why you would want to block blue light from your life. If you are on this page you probably know a thing or two about the negative effects of blue light on our sleep and eye health. With our constant exposure to digital screens, we should be at least slightly aware about our blue light exposure and how much time we spend in front of computers daily. Taking this into account let’s look at all known ways to block light around us from entering our eyes. 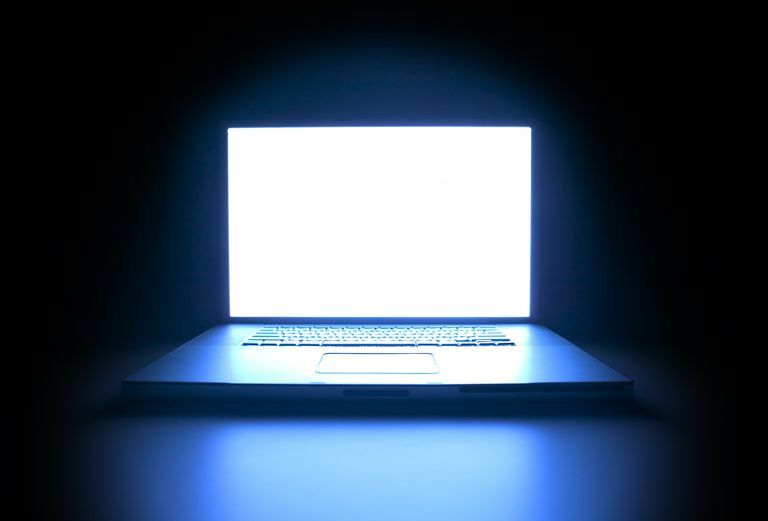 You have 6 ways to block blue light from your life and screens. The first one is to place something on your eyes. 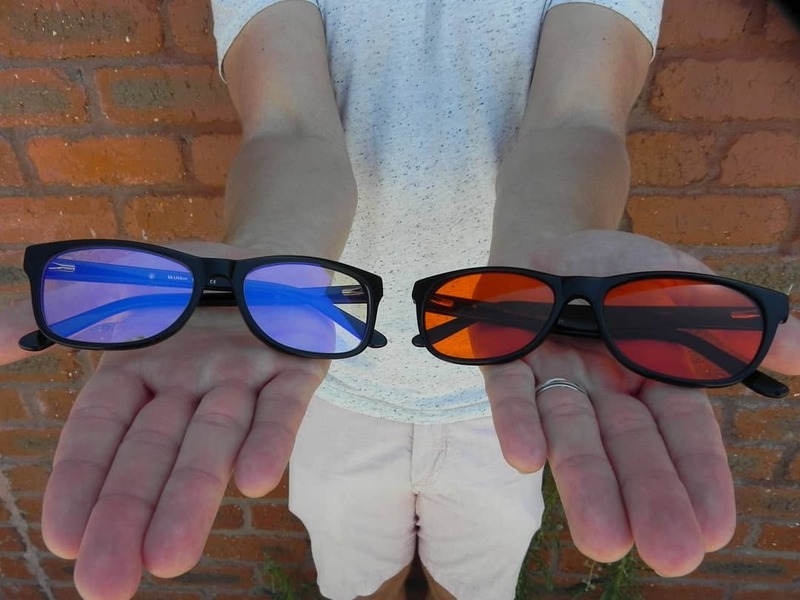 This is what blue light filter glasses, orange glasses, and just regular sunglasses are. The second is to place something on your screen. In the most basic case, it can be just some orange, red or yellow sheet but some companies make a little better filter sheets and they cut it in the right size for you plus some glue to look more beautiful. The third is to use special software which can lower the blue light programmatically with the help of the video card. 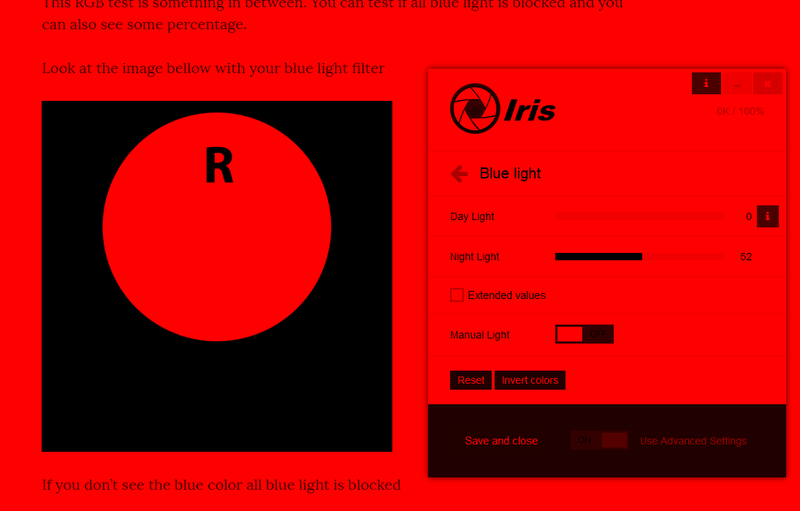 This is what Iris, f.lux, Redshift and every native blue light filter application does. It’s super effective, cheap and customizable solution, but also has some drawback like it can’t block just blue-turquoise blue light or part of the spectrum of blue light. Effects like this can only be achieved with glasses or physical filters. 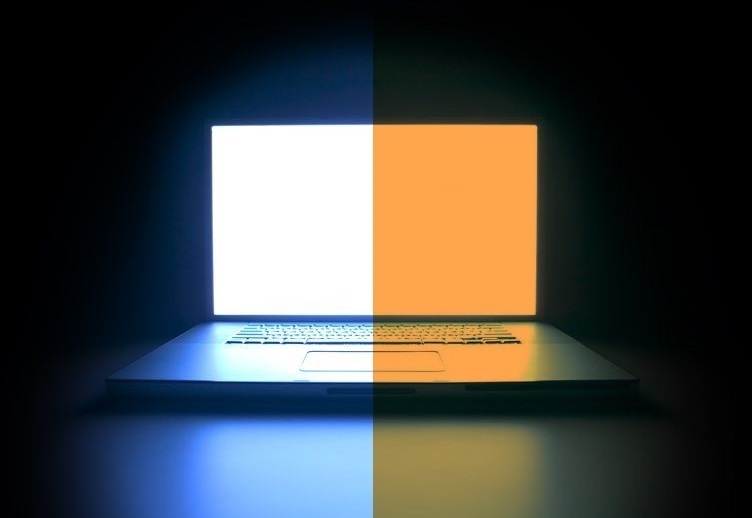 Some monitors also have something called Low Blue Light mode but most of the time it’s just a marketing trick for something that every monitor has from more than 10 years. I will talk about this after a moment so let’s return to our ways to block blue light from your life and screen. The fourth way is to place transparent overlay with software on your screen. This is what most Android apps for blue light reduction do. You may notice how they are redder always and how they are a little worse than software alternatives for your PC but the truth is that there is just no other way for developers to make something better for Android. On Android devices which are rooted, you can access the device drivers and this is what f.lux and CF.lumen does but most normal people will never jailbreak their phone. Fortunately in the newest devices, Android includes something called Night Light which is native video card filter and it works at least but bad. No automation, no super low values and the things I really need in one blue light filter like Iris for computers have. All developers of blue light filter apps would be really happy if Android and iOS open their API to the public but it’s understandable from their side. If you do something bad with the video card you can make the entire screen of the person black and unusable and eye protection apps are tricky for development. Aside from this, you can make the screen black the same way with the Screen Overlay on Android but it’s high-level API and I’m happy that it’s open to the public. I’m going to put the last two ways into this category because they are basically the same. Some new monitors come with the so-called Low Blue Light mode this is just a marketing trick for the old Color Temperature menu that every monitor and TV has. So you can lower the blue light via hardware way on near all monitors but what this is missing is the automation. This is important because every change via monitor buttons take around half a minute for someone who is fast. Well, you can get this to 10 seconds if you are really fast, but it’s still cumbersome. I will also mention how you can lower the blue light on every TV later in this article. As always there is no best way that some ways which are better for certain situation. Glasses are great for blocking all blue light around you without touching anything. You can block blue light from your lighting, from the TV and even from the Sun. Plastic sheets are set and forget and sometimes they don’t make the monitor to look orange, but blue light may not be blocked entirely. 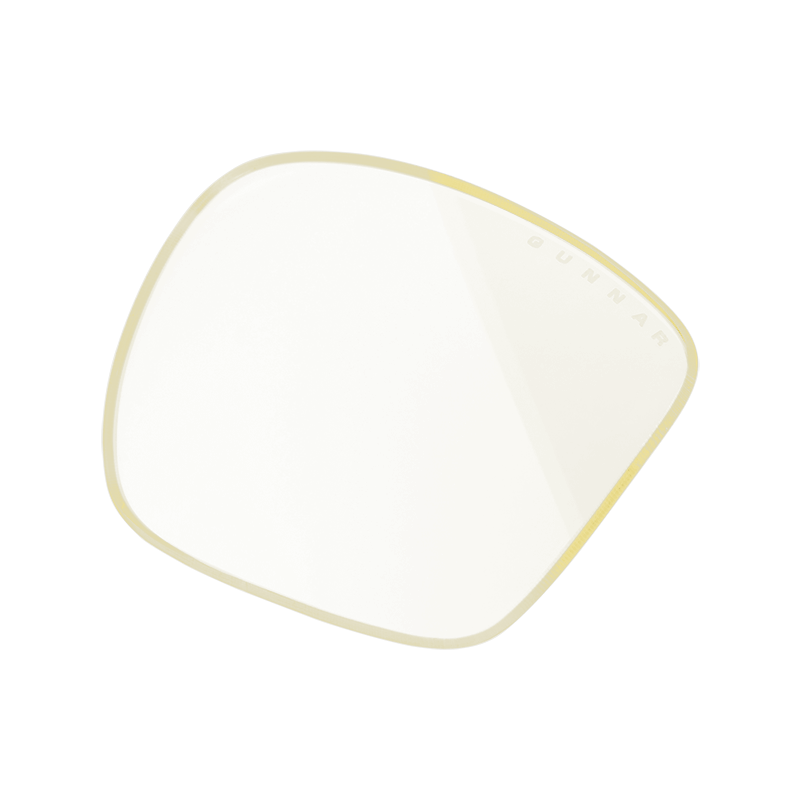 Both Glasses and Plastic sheets are not customizable in their reduction so if you want stronger or lighter filter you need to buy new lenses or sheets. Native filters are probably the best solution for PC but they do require Root or Jailbreak on your phone. They also can’t work on every device. Windows Phone and TVs are examples on which blue light filter apps can’t be made. Screen Overlay apps are great for Android but they decrease the contrast and are not the best solution for eye strain. Display buttons are better are reducing blue light than any other software but you can’t automate the buttons with software. 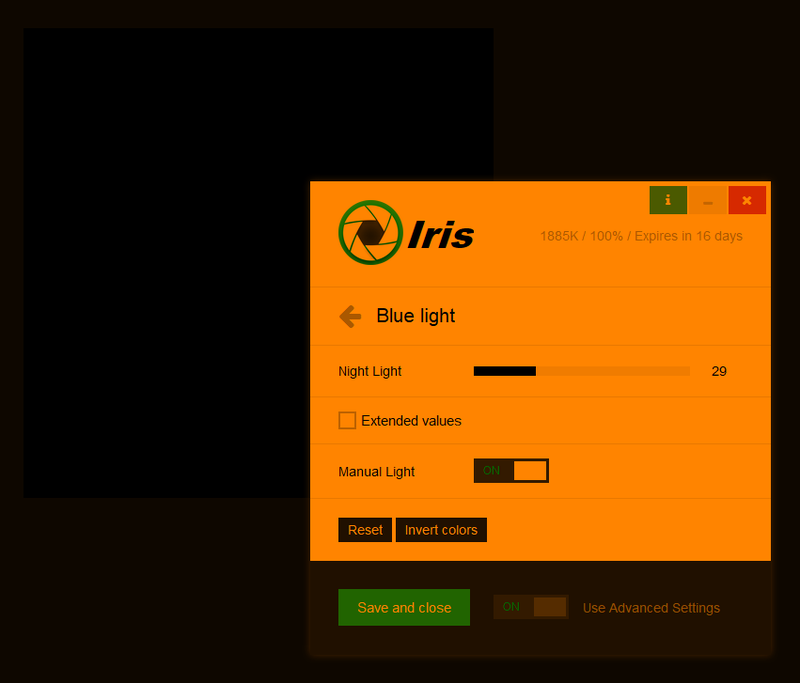 One thing I work on right now is to combine the automation of Iris with the hardware reduce of blue light via software. Basically to automatically click the buttons via software. 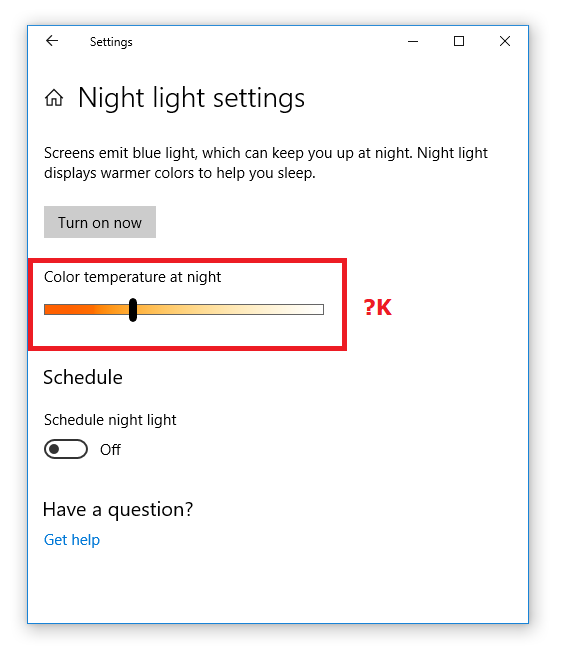 Aside from this, you can’t remove all blue light with Display buttons since they usually go no lower than 4000 K of color temperature which is still a really high amount of blue light. Low Blue Light screens improve the condition a bit with stronger filters but they too can’t be automated based on the time of the day which is what most software products do. In conclusion, each of the above methods has some pros and cons that we will discuss in greater details later. Before the beginning of this century, scientist knew that the eye contains 2 types of photoreceptor cells called Rods and Cones. Out of all photoreceptors in our eye more than 95% are rods. They are responsible for our night vision and are also really bad at recognizing colors. 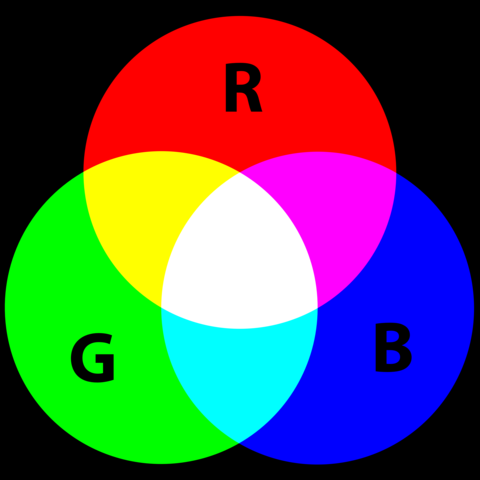 Rods are not so sensitive to colors and this is the reason why it’s hard for us to see the color of things when it’s dark. Cones are mostly around the center of our retina. Thanks to cones we can see things in bright light be it sun or artificial lights. There are 3 types of cones: red, green and blue and thanks to them our eye is awesome and detecting colors and distinguishing things with different colors. 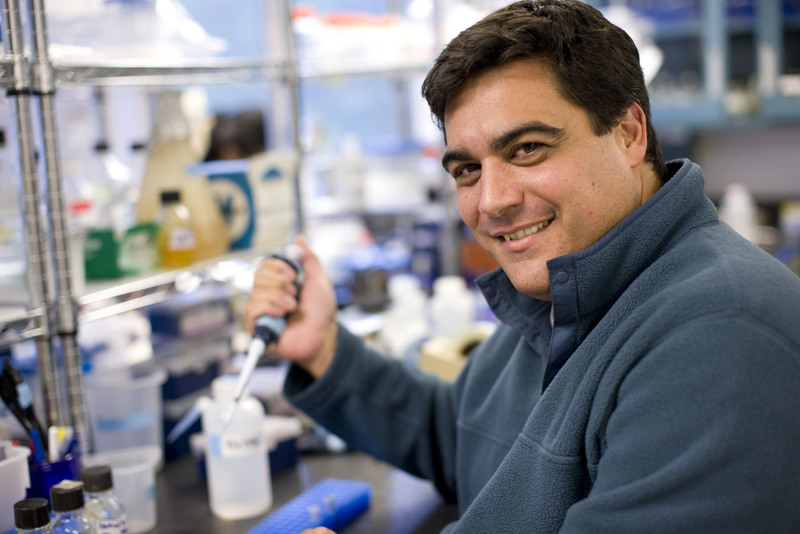 Then in 1998 Ignacio Provencio found new photoreceptor called Melanopsin and for the first time proved that light is not only useful for our vision, but it’s critical for many biological processes. It turns out that Melanopsin is present in much more mammals and it doesn’t play any role in our vision. 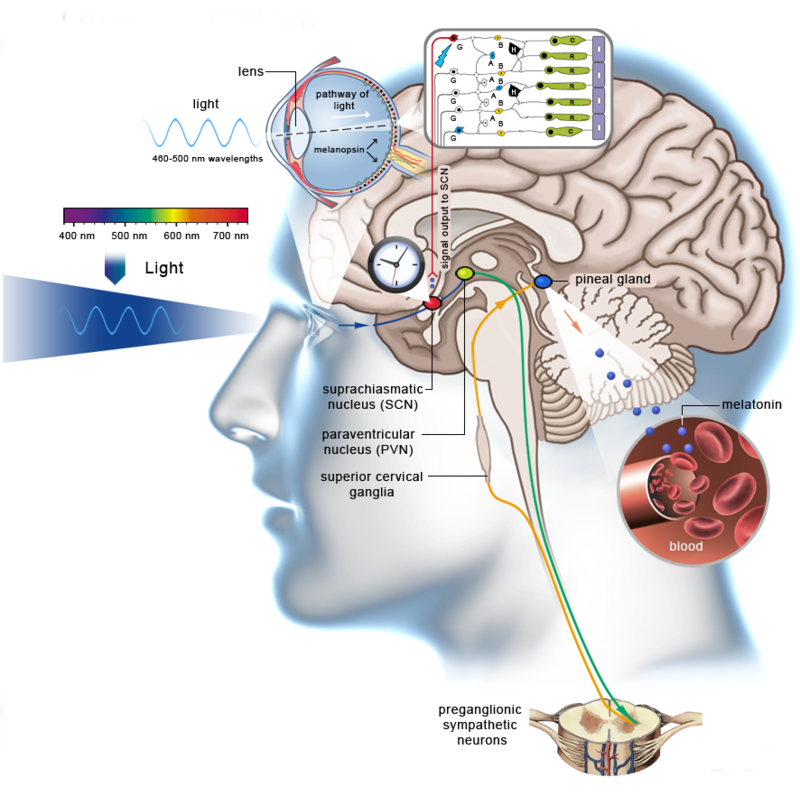 The main role of Melanopsin is to control our biological clock and circadian rhythms. It does this by detecting when blue light is present in our environment. 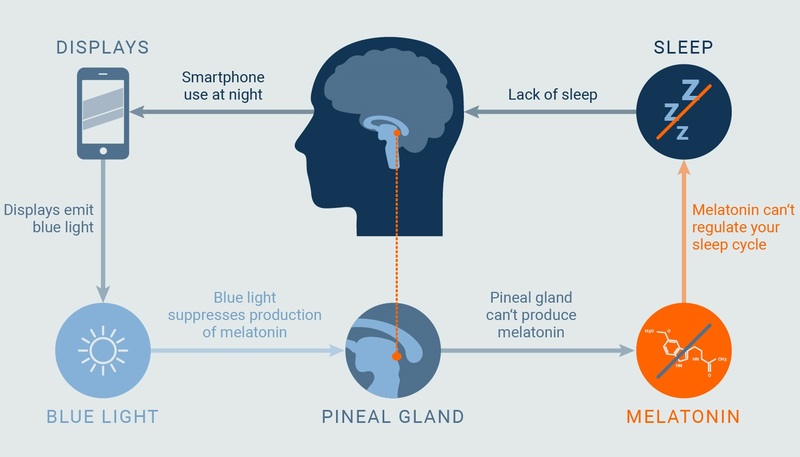 Melanopsin activates when blue light enters our eye and it sends a signal to our brain that it’s day and our brains stops the secretion of our sleep hormone melatonin. Melatonin from his side controls a large number of processes in our bodies and is responsible for our good night sleep. When we have melatonin in our bodies we feel sleepy and this is the reason why you can’t fall asleep when you sit in front of the computer at night. While Michael Herf didn’t know about Ignacio Provencio at the beginning he created f.lux to match his monitor colors to the light in the room. 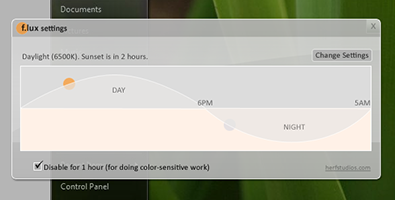 The first version of f.lux was something like a command line app which gives you color filters when you request them. 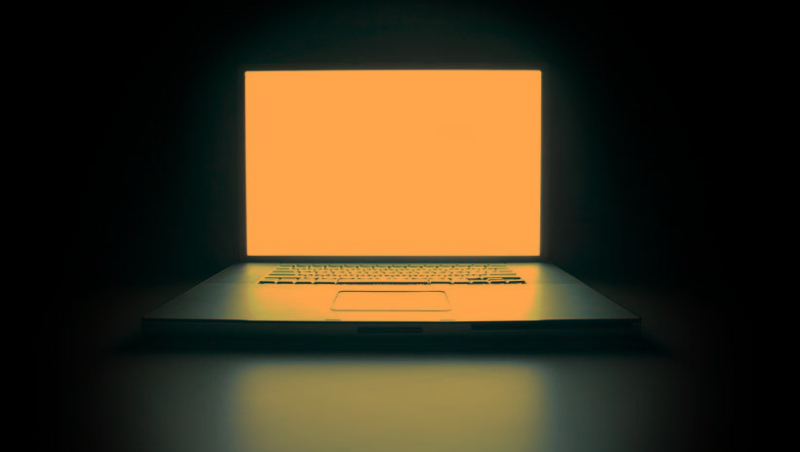 After Michael and Lorna found that the orange screen filter makes them feel more relaxed at night they started researching the topic of light and sleep. Lorna remembered from a biology class that birds migrated according to the season and the main reason for it was the blue light. 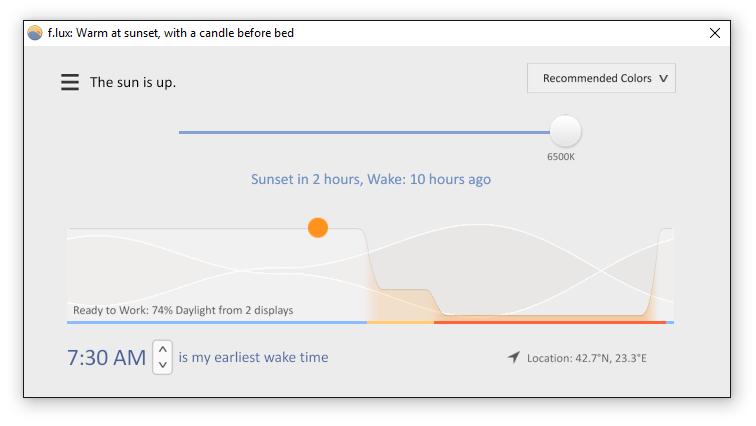 The first version of f.lux automatically synchronized itself with sunrise and sunset and actually, this is the main feature of f.lux even to this day. Created in 2008 f.lux was the first blue light filter. A lot of other programs came into the following years, blue blocker glasses started to emerge and in one point monitor manufactures started to make low blue light monitors. Several companies like Microsoft, Google, and Apple integrated low blue light filters into their operating systems and opened the blue light research to the mass audience recently. We may say that f.lux is the father of all blue light filters but during the years better alternatives started to emerge. Part of the reason is that the app remains free even to this day and free software generally don’t pay salaries to people who can create great products. 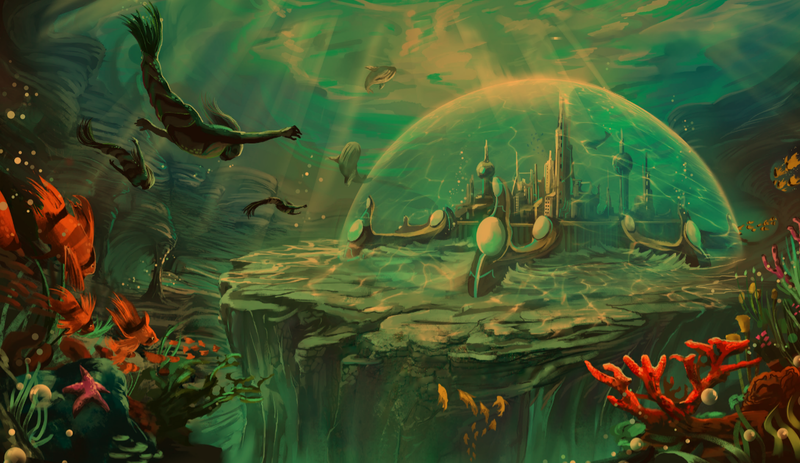 As everything in life, it wouldn’t be a complete story without an open source software. 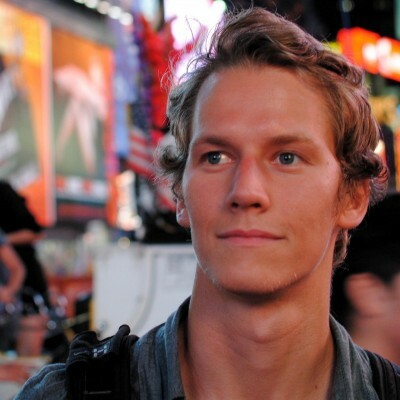 Inspired by f.lux, Jon Lund Steffensen created Redshift in 2009. The point of Redshift was simple. 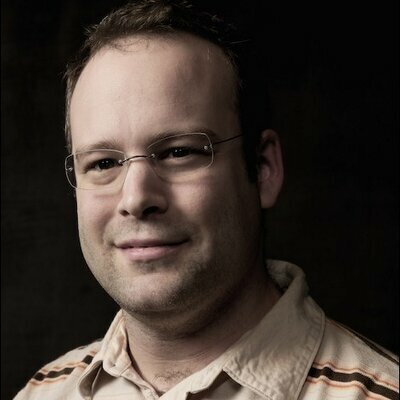 Bring f.lux to the Linux world. 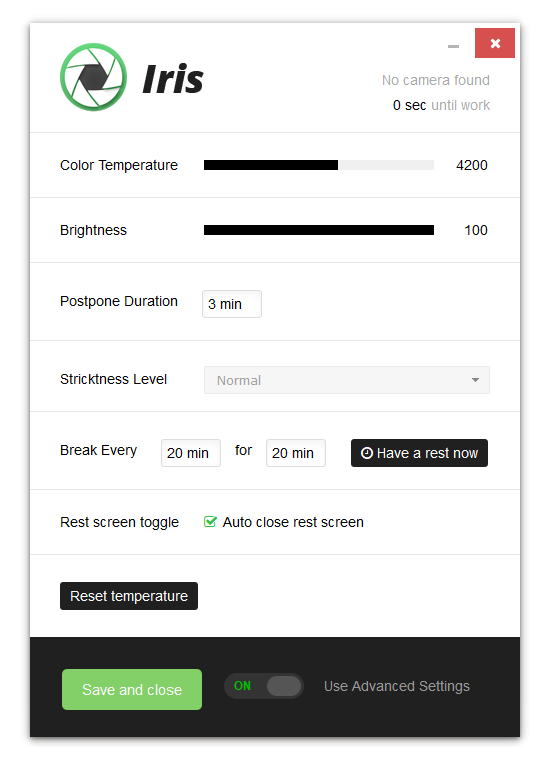 Adjusting the screen color temperature based on the time of the day again Redshift was the first open source project for blue light reduction. Free, open source and customizable the software gained popularity among Linux users. Over the years the software became more user-friendly, it now has some simple UI and supports several different platforms like Windows, macOS, and Linux. F.lux and Redshift created the first blue light filter software for the PC but there were 1 billion devices running Android without any solution for lowering blue light. 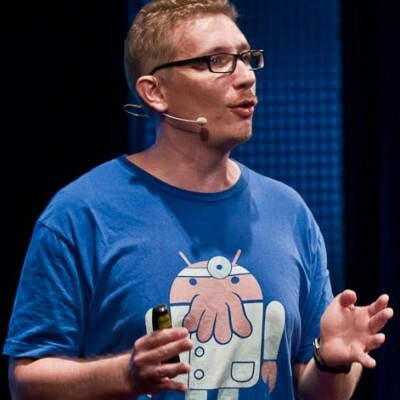 You may have heard about Urbandroid Team but you probably don’t know about the mastermind behind it Petr Nalevka. Several years after creating one of the most popular Android apps Sleep as Android somewhere in 2013 he came out with Twilight. 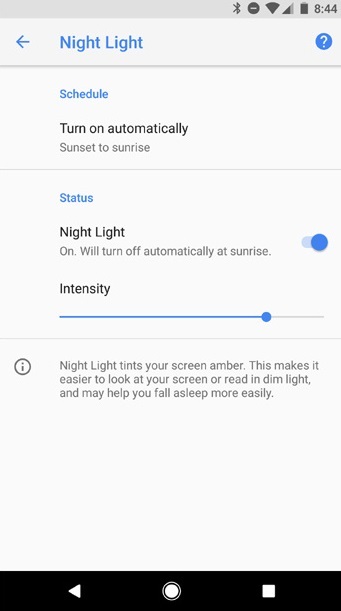 The first blue light filter app on Android Twilight found a way to lower the blue light on the closed Android platform. 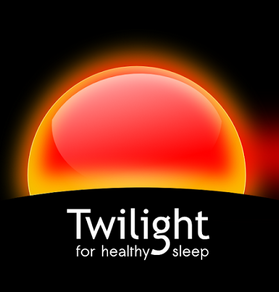 While the approach of Twilight is really poor compared to the native gamma approach which computer softwares use, Twilight still made a huge step for improving the sleep and eye health of Android users. 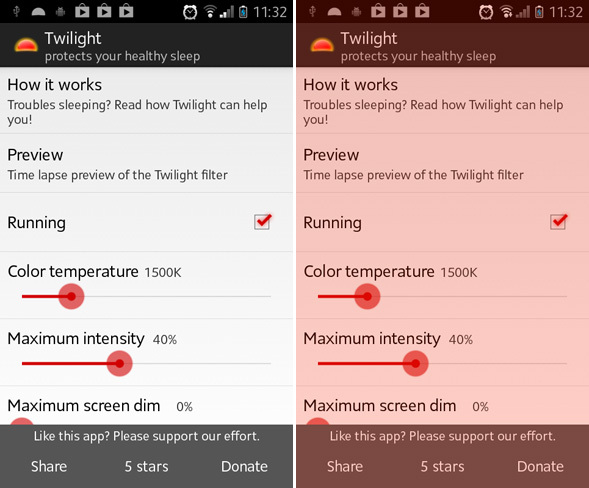 The Color temperature values are not actually real because Twilight is using the Overlay approach with transparent red color but still it was the first solution for Android. Back at 2015 nobody looked seriously into the eye problems caused by computer monitors. There were the blue light filter tools like f.lux, Redshift and Twilight but most of the people who knew about them were mostly geeks. On the other part of the spectrum, there were programs like WorkRave which reminded you to take breaks from time to time but they were just nice to have reminders. I remember how I searched for weeks programs to help me with my eye pain. My story was simple. I started working as a programmer at the age of 17 and wanted to become the best programmer in the company. This goal of mine caused me to spend 14 to 16 hours per day in front of the monitor looking at digital letters and learning new things. I was going to work for 8 to 10 hours then back home working on a side project which I really wanted to become my own business one day. After a year of this “balanced” work routine and thousands of artificial tear bottles, I finally decided that maybe I need to go to the eye doctor to see why my eyes were hurting so much. She prescribed me glasses and for the first time in my life, I felt hopeless about my eye conditions. This was the turning point after which I started to read everything related to eye pain and eye health. I started to do some exercises from time to time. I found WorkRave, EyeLeo and other break reminders. I found f.lux and after some months of experimentation with blue light, rests, exercises and a lot of blinking I actually started to feel really good. As I test this again now several years later I see that the program has been improved a lot but you can skip the rest again if you want with some key combinations. What I wanted at the beginning of 2015 was a break reminding timer which I can’t skip with my programming knowledge. The first version of Iris was actually just that. I made myself a timer which locks my screen and disables my keyboard on a specific time interval. I started using my own custom app for break reminding but was still using f.lux for the blue light. My problem with f.lux back then was that it wasn’t able to go lower than 2700K back then. It was able during the night to go to 1200K via a special menu but the lowest value during the day was 2700K. I guess this was intentional but I just wanted to be able to manually customize it. Also, there was no way for manual control, only the day and night things based on the time of the day. I remember how I wrote to the support e-mail several times and even tried to tweet and write to Herf several times to add manual control. After I realized that maybe f.lux will never get an update and my problem will never be fixed I started searching for alternatives. I’m actually pretty sure that if it wasn’t for Iris f.lux indeed would never receive an update like the resent new version. Back in 2015, there were no alternatives. A good version of Redshift was just not available and SunsetScreen was still not created. So I decided to find a way to make this and add a blue light control to Iris. 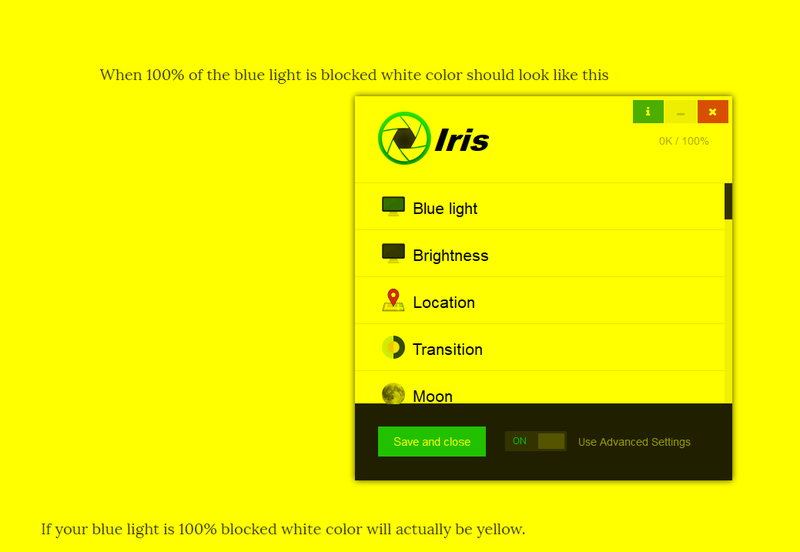 After several months the first version of Iris was born and it was super ugly. I didn’t know how to count versions so I just named this Iris-0.0.0. At least it was working the way I wanted a blue light filter to work. From then on I started improving the program. I found that eye strain is not only about blue light. There are also PWM flicker, font rendering, blinking, brightness automation, subpixel flicker and much more. Over the next several years I gradually solved all problems I found. Iris was free back then and I mean totally free. 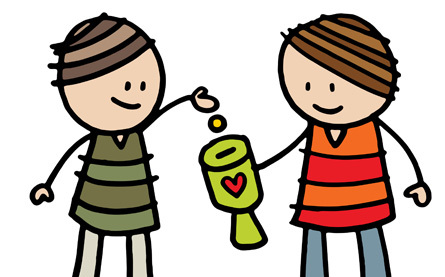 After several months of non-stop work, I decided to place a donation button on the website. I also quit my job to dedicate my life to help people feel less eye strain. Back in 2015, I believed that people will send me some money because they appreciate my work and I would be able to sustain myself while working full time on Iris. At the end of 2015 after I almost starved myself to death I realized that I may be wrong. This was how Iris was looking back then. I actually still have all versions and you can still use these versions of Iris for free but I almost quit. After 1 year of non-stop work trying to make the best software for eye protection and 0$ revenue from donations, I had 2 choices. Abandon the project and start a job again or make it work. As you can guess I choose to give my everything to Iris. I started selling all kinds of Chinese stuff to make some money and made Iris paid. The software was still too bad for anyone to buy it but after several months I made my first sale, then the second then the third. 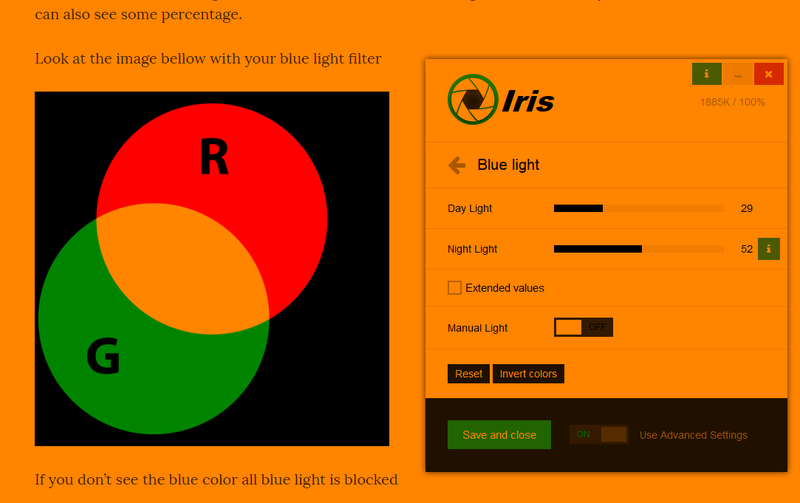 Many people these days ask me how I can charge for this kind of software but Iris actually drove the blue light filter revolution. I chose to make a paid product because I didn’t want to show ads. And I chose to make a great product for few users instead of crappy product for everyone. 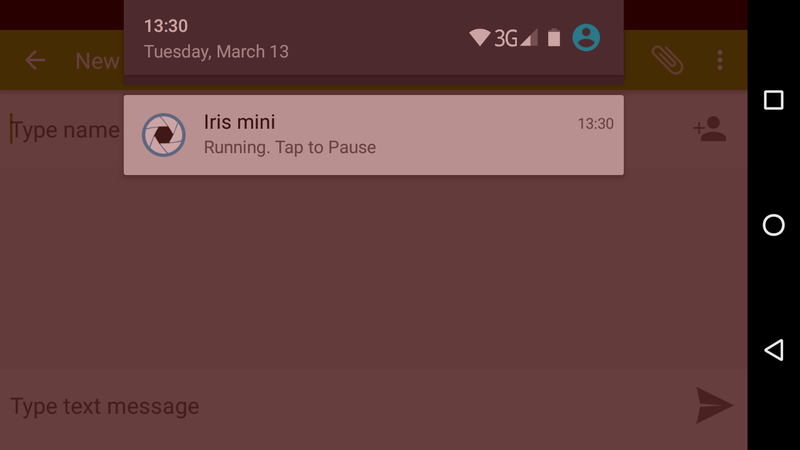 Iris was the first product to automatically pause itself when some program is running. 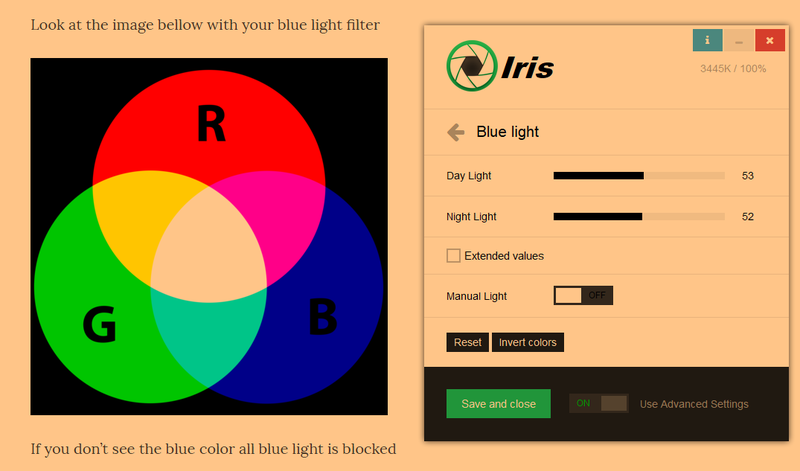 Iris was the first product to have flicker free brightness automation. Iris became the first product to support USB monitors even before they made drivers for them. The first product with UI for Windows, macOS, and Linux. The first product with native Chrome extension. First product for iOS without jailbreak. The first product to work per monitor and first to improve font rendering. I can talk a lot but Iris inspired the renaissance of blue light filters. Most of the features in the new f.lux are based on the things that were available for years in Iris. This makes me happy and I am glad that competition made monitors more healthy for the eyes. 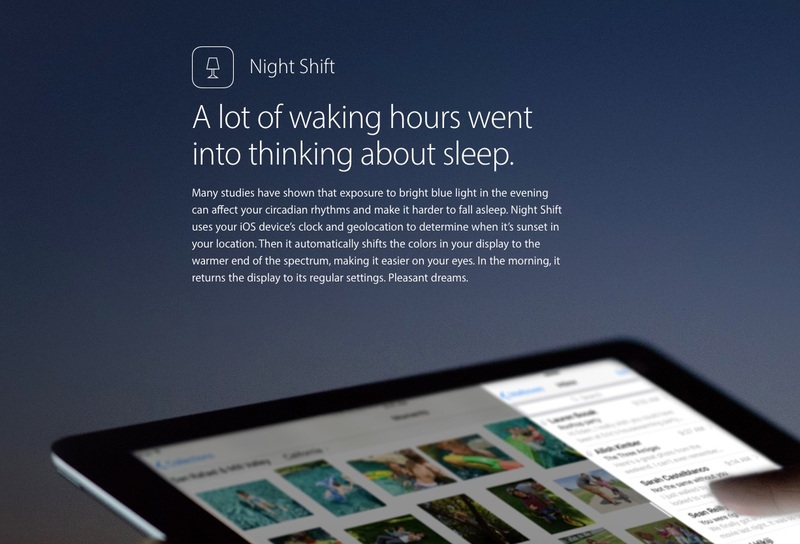 Starting with Night Shift which was actually a really unfair move from Apple to f.lux, Native blue light filter solutions started to emerge. The unfair thing is that f.lux for years was available for jailbroken devices via Cydia but because it’s using a private API it was against Apple rules and Apple didn’t allow it into the AppStore. Tasks like this are really good to be handled by the operating system but most of the time their solution to the blue light problem is really bad. So Apple came out with this groundbreaking innovation called blue light filter and removed the f.lux app from everywhere. There was some kind of petitions about this but Apple was actually right. Apps are eligible for Sideloading if they are open source so if the team behind f.lux really wanted to have their application available they could just open the source code. Since the app was free I don’t see a problem but only they know what works best for them. The good thing about the whole thing was that companies started to care about blue light all at once. 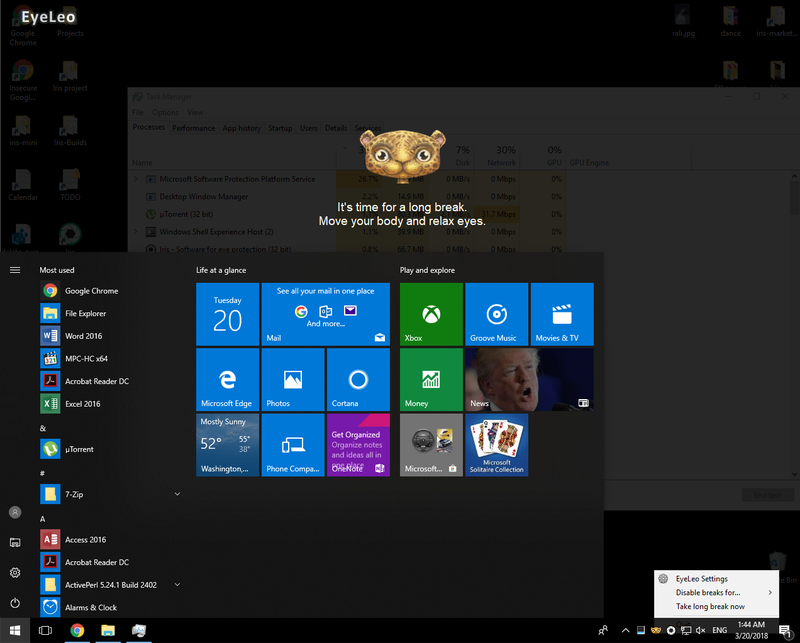 Microsoft added something called Night Light in the newest versions of Windows 10. Android also introduced their implementation of a blue light filter also called Night Light. The good thing about the native Android Night Light is that in comparison to Twilight it’s not a transparent filter but real gamma blue light reduction which works better and increases contrast. 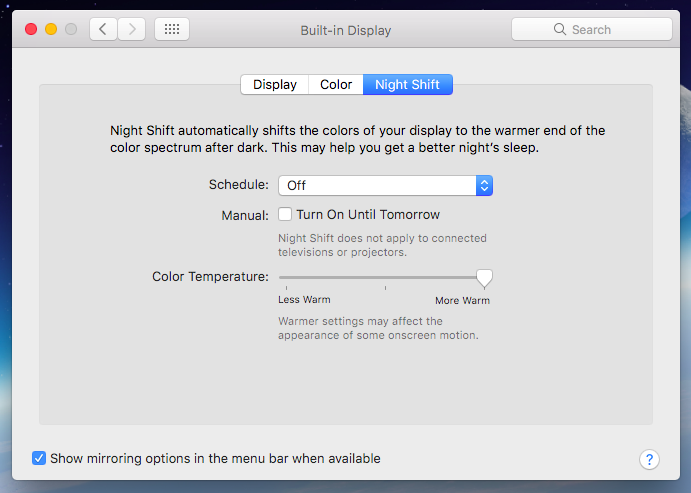 And of course, Night Shift came to macOS. Every day more and more people learn about the benefits of setting a proper light environment for their eye health. Every day more and more people learn how to set up and customize their monitor and light for the best eye health and every day more and more eyes are saved from macular degeneration thanks to all these products and much more. I talked a lot about the software blue light filters but there was one parallel blue light revolution in the face of blue light filter glasses. Founded in 2006 way before f.lux came into existence Gunnar was actually the first product to try to fight computer vision syndrome and to filter blue light with the help of special lenses. We can say that eye safety glasses were the first blue blockers but still Gunnar Optiks was the first commercial product of it’s kind. The woman in the picture above is actually Gunnar co-founder Jenny Michelsen. She started Gunnar in her garage in search of a solution for her husband’s digitally induced migraines. Jenny son name is actually Gunnar and the name of the company comes from his name. The idea for the glasses was born out of one woman’s frustration with her husband’s digitally induced migraines and worry about the eyes of her child who was fascinated by technology. Jenny Michelsen’s husband, Matt, was suffering from the headaches he had after hours sitting in front of six computer screens. The headaches, the Michelsens would learn, were a symptom of Computer Vision Syndrome, a collection of minor ailments that build up over time. As the Rancho Santa Fe woman urged her husband to see a doctor, she wondered whether her 3-year-old son, Gunnar, was getting a jump-start on similar problems. If she and her husband believed the computers were getting to their eyes – and they didn’t start using electronics until they were in their 20s – what would happen to Gunnar’s generation? An estimated 125 million Americans suffer from what is now commonly referred to as Digital Eye Fatigue or Computer Vision Syndrome (CVS), according to the American Optometric Association. Matt and Jenny Michelsen reached out to their close friend, Joe Croft, a former Oakley engineer, about the issues surrounding CVS. They wanted to learn more about the effects of focusing on a digital image projected on a screen just inches from one’s face for hours at a time and years on end. The Crofts and the Michelsens began their five-year road to launch by talking to medical experts. One of those experts was Dr. Jeffrey Anschel, a Carlsbad optometrist who has become an expert in Computer Vision Syndrome and Visual Ergonomics. He noticed the problem about 17 years ago when employees of a nearby computer company began complaining about dry and tired eyes and difficulty focusing. They were problems that people generally didn’t experience until they were in their 40s, but these patients were in their early 30s. It didn’t take him long to make the connection between their work and the required time spent in front of a computer screen. “You can work, shop, communicate and do just about everything from your computer now, and people just don’t realize how much time they’re spending looking at the screen. The digital images that computers project are one factor contributing to Computer Vision Syndrome. The eye focuses on the hard edge of an image, but digital images don’t have a clean edge. Anschel also noted, “that when people spend long periods focusing on something close to their face, eye muscles tend to lock into a singular position, which is tiring and can push the eye down the path to becoming farsighted. Meanwhile, the eye has to deal with light from conflicting sources, such as sunlight, that are much brighter than the computer screen. There’s also glare from the light shining into the eyes. And the angle of view for the computer screen, which is straight ahead, isn’t desirable. Croft and Michelsen eventually took a prototype to Anschel and explained the important components of the glasses. They had an amber-tinted lens, which makes images appear clearer. Yellow makes images sharper by adding contrast and filtering out blue light. The lens is also shaped to pre-focus the light into the eyes, so the eyes don’t have to do all the work. There’s also an anti-glare filter that allows light from the computer in but keeps out distracting reflected light from other sources. The lenses are also designed to be fitted close to the face, creating a “micro-climate” that keeps away the dry air currents. This helps keep eyes moist by reducing squinting and maintaining a closer-to-normal rate of blinking - a leading cause of dry eyes. 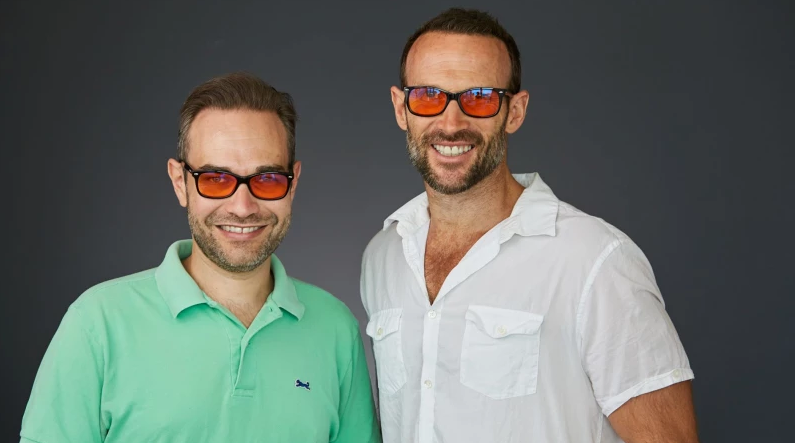 Croft and Michelsen set out to create a product that addresses the issues associated with digital eye-strain. They completed their first prototype in 2006. In early 2007, they founded the company and in October of 2008, they launched their first product. Investors in the company include Peter Thiel (a founder of PayPal and early investor in Facebook), 50 Cent, Carl Zeiss Vision, Monster, Inc., Christopher Burch and Happy Madison Productions. I think the Gunnar glasses were the first and main innovator of blue light filter glasses so I will not talk much about others. Note that many big names and hundreds of different brands make blue light filter glasses so Gunnar is not unique in any way. Almost all blue blocking glasses do the exact same thing and they do it badly. I will review many different brands but here are some things I want to make clear now. Sunglasses block more blue light than many blue blockers. You can find a test how Sunglasses block as much as 40% of the blue light while some blue light filter glasses block less than 10%. 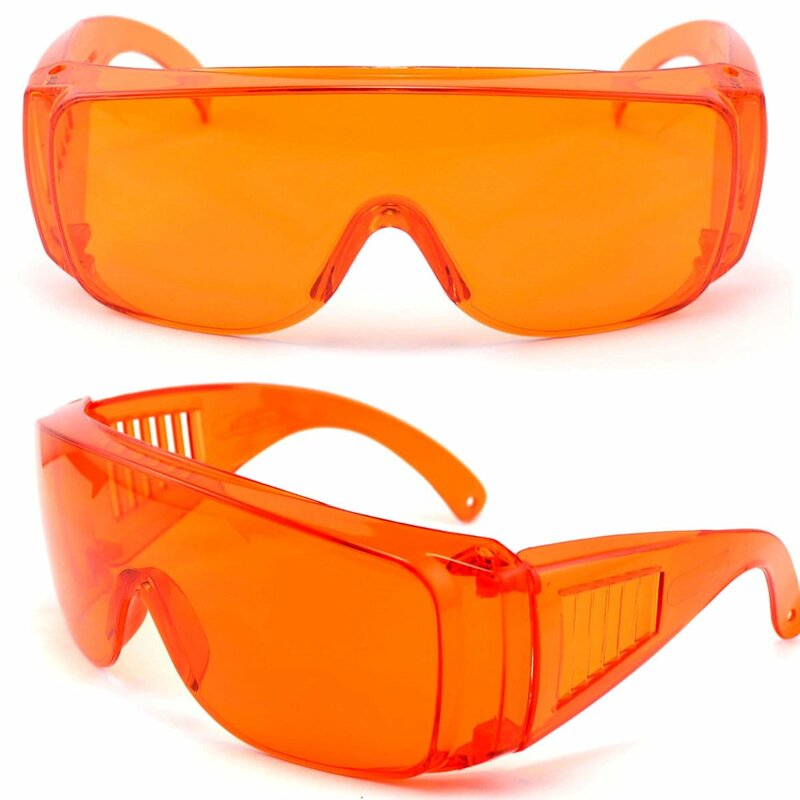 You can also find Orange safety glasses which are under $10 and block more than 90% of the blue light. If you have ever been to a dentist for whitening they place you red glasses so your eyes don’t get damaged from the UV light used for whitening your teeth. 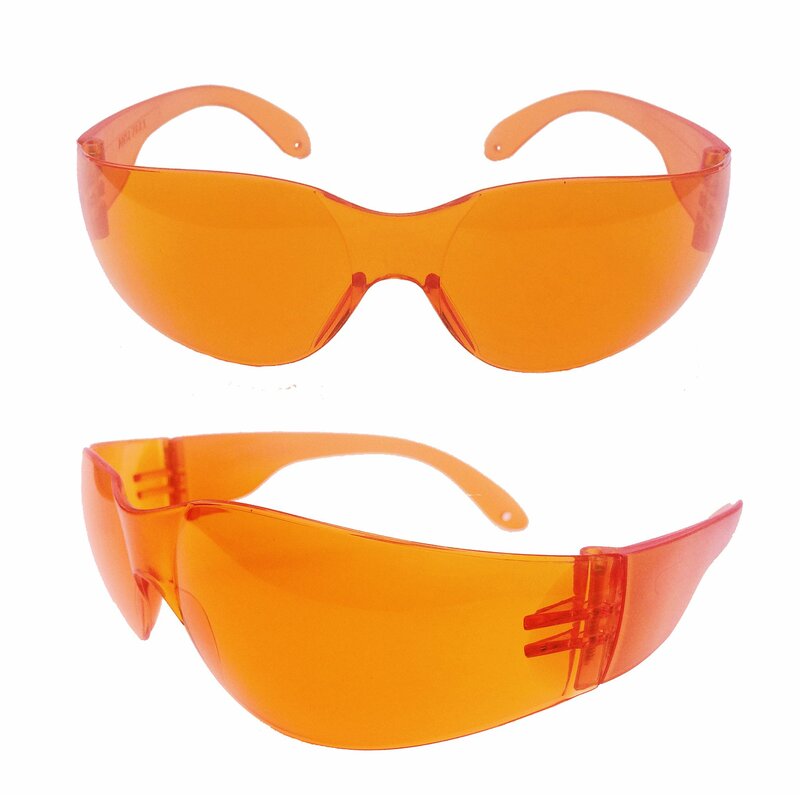 Well if you are really concerned about the blue light I suggest you to buy a Dental safety protective glasses which are also under $10 and block all blue light. 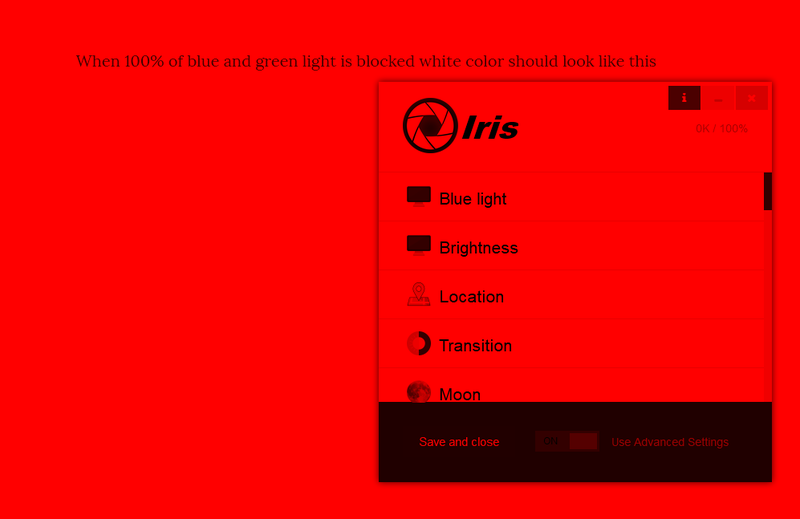 This and all other fully red glasses block 100% of the blue light. I will talk more about the different model of blue light filter glasses but you need to know that most slightly yellow glasses don’t do anything. 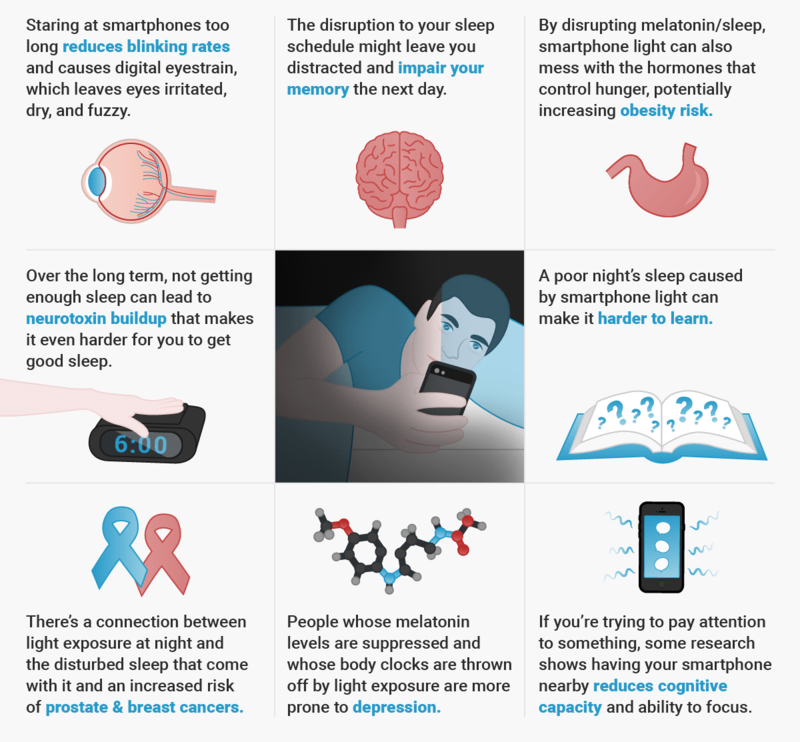 They don’t help you to sleep better and they don’t stop a lot of blue light. 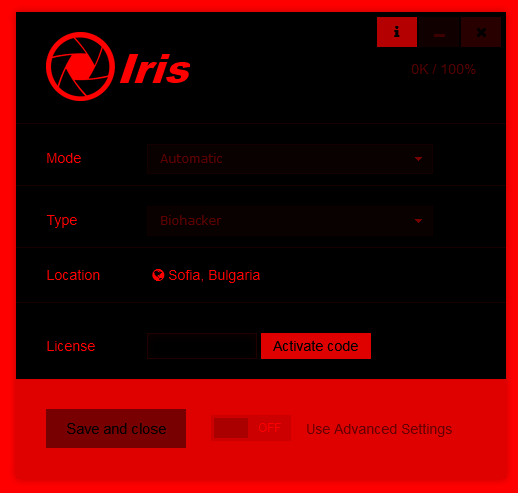 The truth is that software like Iris is way more if you want to use them in front of a computer. The only reason to buy blue light filter glasses should be if you have bad lighting or watch a TV a lot and software don’t support your screen. Another reason is if you want to do some biohacking and wear them outside. 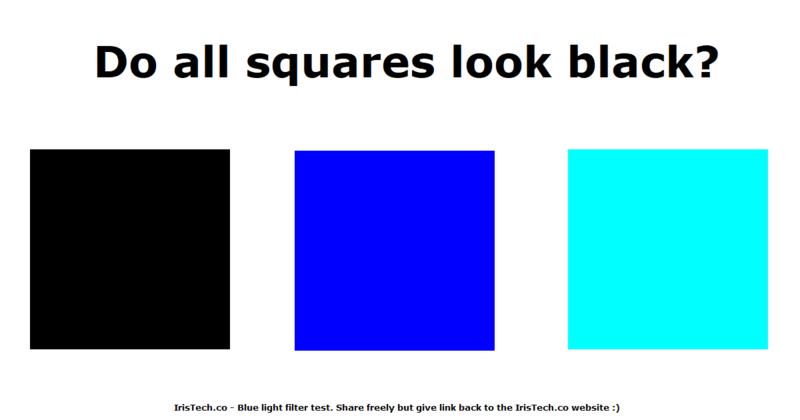 With your blue light filter look at the image above and if all squares look black all blue light is blocked. If the image is black and you don’t see any blue all blue light is blocked. 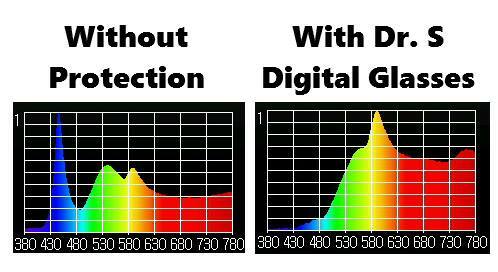 Ideally, if your monitor doesn’t emit blue or blue and green light you shouldn’t see a change in the color. 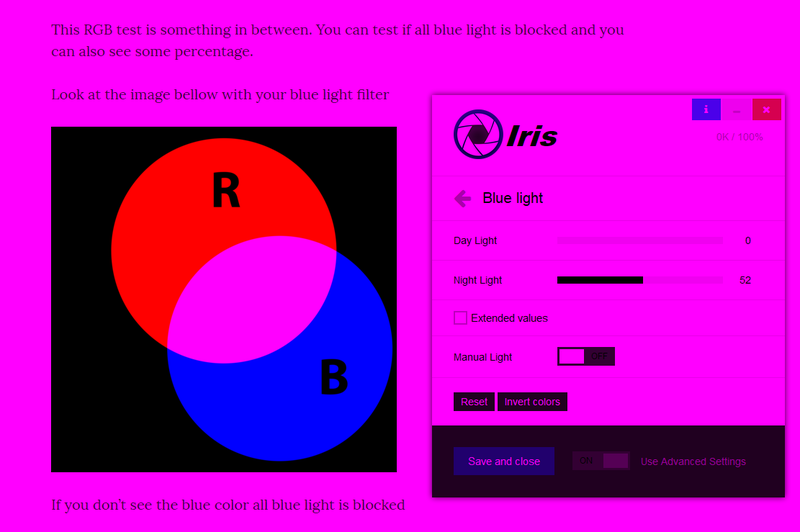 For more info about the Iris blue light filter test visit How to check if my Monitor emits Blue light? If your blue light is 100% blocked white color will actually be yellow. 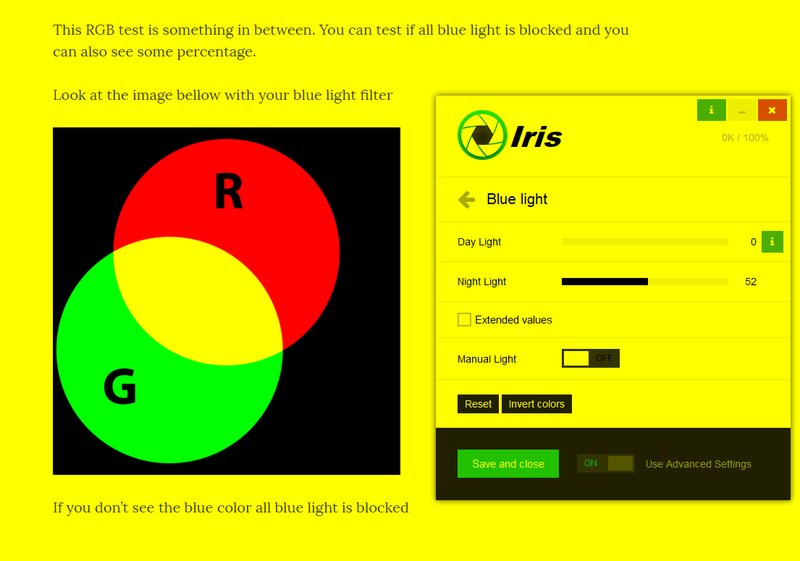 Note that you can’t actually test how much blue light your blue light filter blocks and if you really need to test this you need a colorimeter. If you want to test if both green and blue light is blocked you need to use some other test images. You may notice that most blue light filter softwares actually don’t look like this at high values. This is because there is a legacy to use Color temperature instead of linear reduction dating to the first versions of f.lux. However, if all blue and green light is removed the result is always red. While the first test was made for easily test if all blue and green light is removed from the screen it was not really good for finding what percentage of blue light is blocked. The second test is really good for finding what percentage is blocked but you need a really sharp eye to see the difference in the colors. This RGB test is something in between. You can test if all blue light is blocked and you can also see some percentage. These were basically the test you can do to see how effective is you blue light filter. You can test this way both software and glasses. 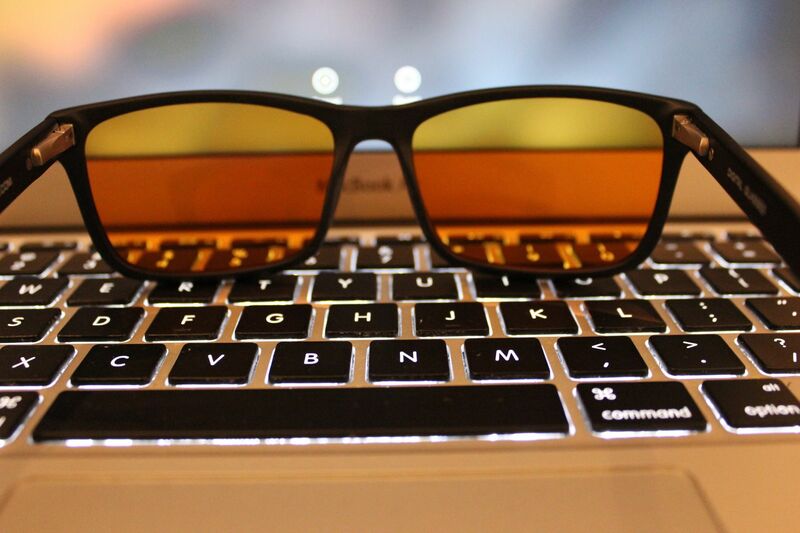 The difference is that with software you will not see emission while with glasses the lest will block the light. In this fictional market, my goal is to collect all products on Earth for reducing blue light. I’m going to the deepest parts of the web in search of the No Blue Light World. There are really a lot of ways to block blue light via glasses. 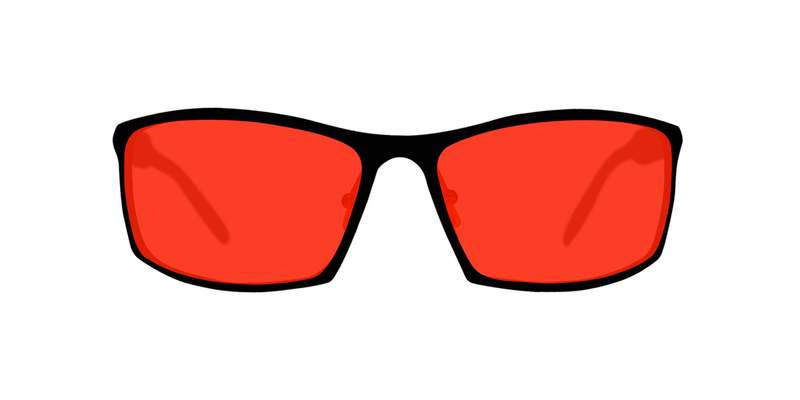 There are blue blockers with a yellow tint, with orange, with a red tint or the regular sunglasses also block some of the blue light aside from the UV light. 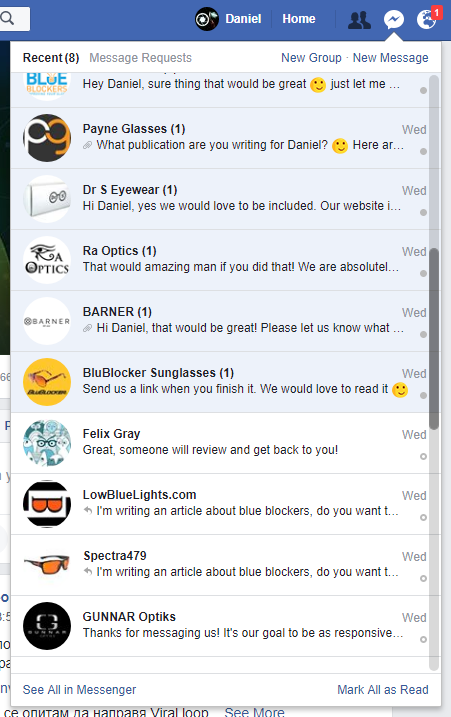 To write the best and most comprehensive article about blue blockers I basically opened Google and contacted more than 100 blue blocking glasses manufacturers and brands. In the beginning, I expected something like 1000 brands but it turned out that there are not many blue light blocking companies in the words. While there are so many companies for regular glasses only some of them produce also blue blocking glasses and fewer than that actually specialize in blue blockers. Most of the best companies for blue blocking glasses turned out to be recently founded companies. What really struck me that the big brands actually had no interest in talking about their products. I wrote to them and most of the time they ignored me or redirected me to a chain of customer support which I just thought it will not be helpful for this article. What surprised me actually was that the small companies are much better at answering questions and their response time is usually lighting fast. Well, I guess it was not so surprising because this is true even with Iris and most companies who succeed in the long run are really great at responding and customer support. I remember how at the beginning of Iris I personally responded to every mail under 1 minute and if I was sleeping when I get some question I had an alarm sound to wake up and respond faster. What was also not surprising is that I already knew some of the guys behind this projects in one way or another. I guess our industry is still really small and there are not a lot of people who care about the negative effects of blue light and technology on our lives. So in this section, I will present everything on the internet I found about blue light filter glasses. I will also include some quotes from the founders or from the team behind the companies. There is not a lot of ordering here and the first companies are just the ones which responded me the fastest which I guess is also a really good measure of how good is their customer support and product but this is not always the case. However, I guess the people who responded the fastest are this who care the most. I am not going to include companies which may have a great product but don’t respond to user questions because I think this is bad user experience and they don’t deserve a spot in this article. I actually just recently saw the Swanwick Sleep glasses after some ad on Facebook. You can use the links above to read more about the Swanwick Sleep but let’s go into a little bit more details now. Swanwick Sleep was founded in 2015 by two Australian brothers – James and Tristan Swanwick. Everything started because James used to have bad sleep that he thought may have been some kind of mental disorder because he couldn’t get any sleep at night and spend his nights tossing and turning. While searching for ways to fix his sleep problems he found about the blue light effect on our bodies and circadian rhythms. Motivated that this may be the solution to his sleep problems he started looking for some cool products to block all blue light from his surrounding. 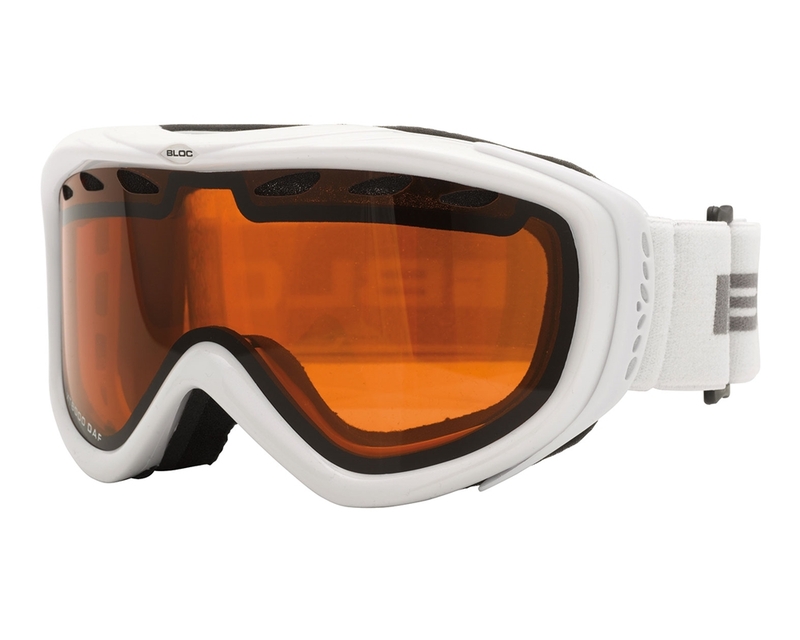 The problem was that most products which actually block all blue light are some ski goggles or protective orange glasses. 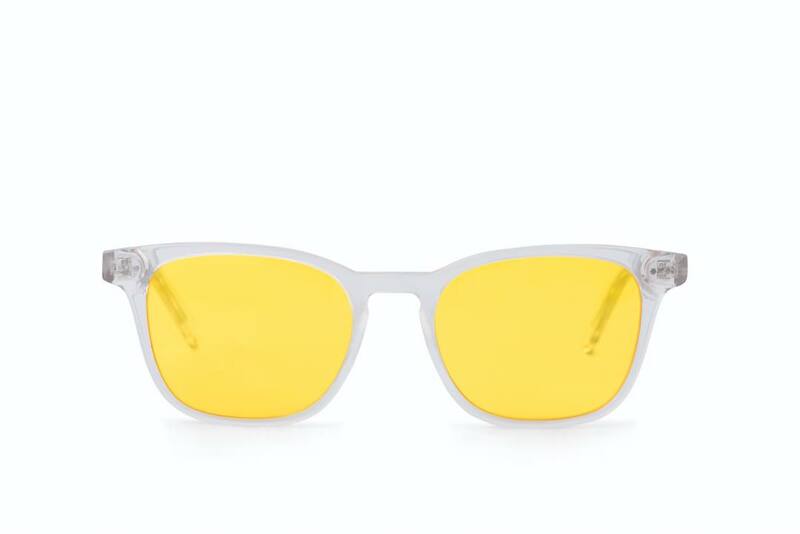 The yellow lenses are also not so effective because they block only some of the blue light. To block all blue light the lenses should be some deep orange filter color. Back then there were some solutions on the market for blocking blue light but all blue blocking glasses were super ugly and he didn’t want to wear them. He also found out about software solutions like Iris, f.lux and also the Night Shift feature of iOS which Apple introduced recently. While blue light filter softwares are really effective and customizable they don’t work on everything. With software, you can’t block the blue light coming from the TV or from the LED lighting around us which becomes more and more popular today. We have LED lights everywhere around us and they emit primary blue light which really disturbs our circadian rhythms. Monitors are just one of the sources of blue light. 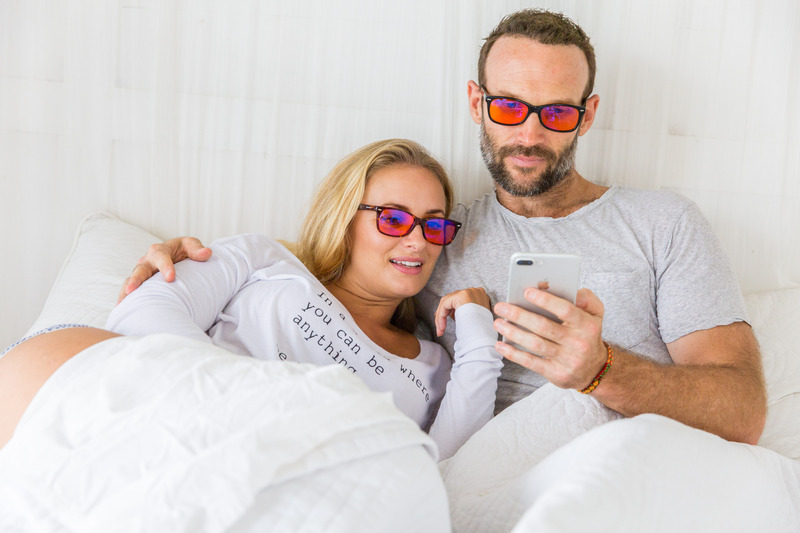 Software cannot block blue light from sunlight, TVs, and Lights so a pair of stylish blue blockers are actually more effective for better sleep. The only bad thing is that you need to make some kind of habit to wear them 1-2 hours before going to sleep as Swanwick brothers recommend. And this is why James decided to create Swanwick sleep. 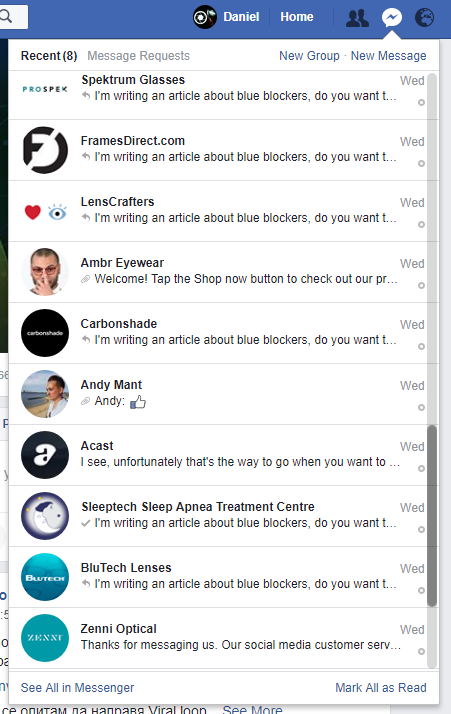 James wanted to make the sexiest and most effective blue blocker possible which works everywhere not just on your PC. He called his brother Tristan to tell him the idea. 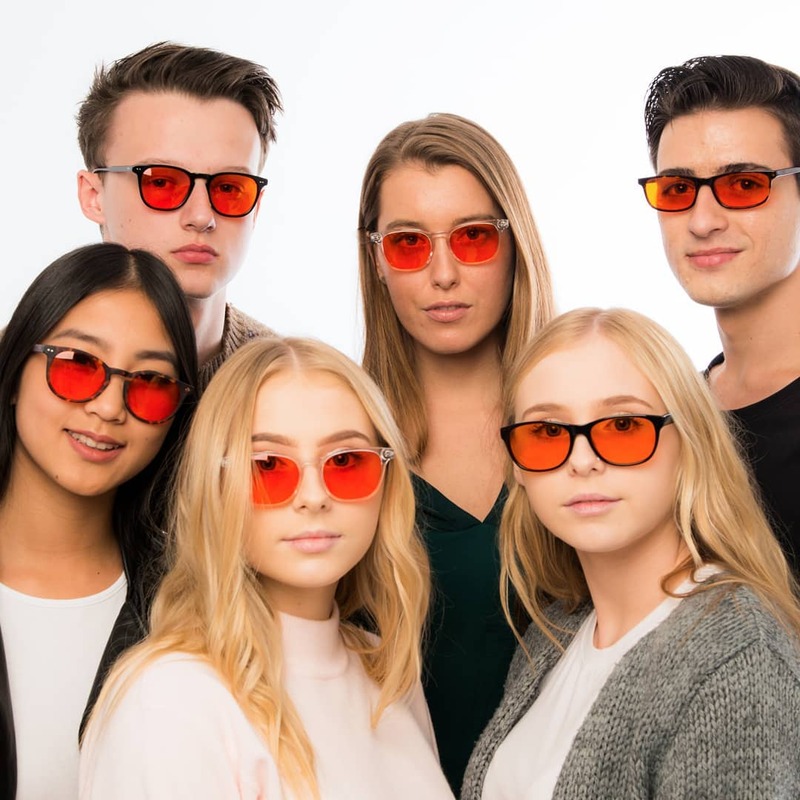 They launched their new business on November 25, 2015 (Black Friday shopping day in the US) with 300 pairs of glasses in stock on Amazon and sold out everything before the end of the year. After this, they sold another 806 pairs in the next six months. 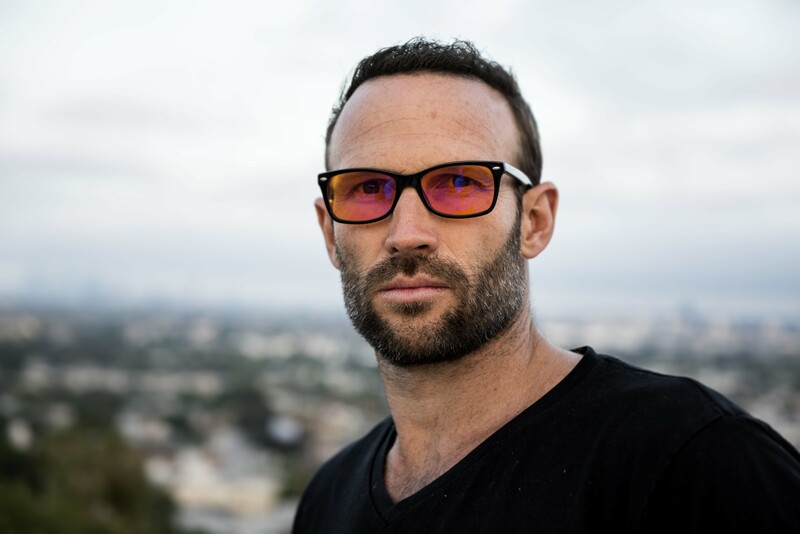 This initial boost motivated the brothers to keep going and until the end of 2017, they already made and sold close to 30,000 pairs of glasses. Thanks to the Amazon FBA program they were able to quickly expand globally to Canada, Britain, USA, Europe, and Australia. The brothers also said that Japan is the next country on their radar. I’m actually not connected in any way with James or Tristan but I really like how they put modern advertising into the blue light blocking field. My goal with this whole article was to combine everyone who cares about the eyes and sleep and let you choose some product to buy because this thing is really important. While I’m a big fan of software because of the customization and automation using glasses is much more simple and intuitive for non-technical people and once you block blue light once you never go back. I would be happy if someone has some measurement of the effectiveness of Swanwick glasses but their lens seems great. However, this lens blocks only blue light. If you are really concerned about the melatonin suppression I would choose red lens because it blocks both blue and green light. The problem with the red lens, however, is that they change the colors too much even I prefer the orange blocking. It’s enough to improve the sleep and also great to not change your surrounding too much. Swanwick glasses are also really stylish and good looking. 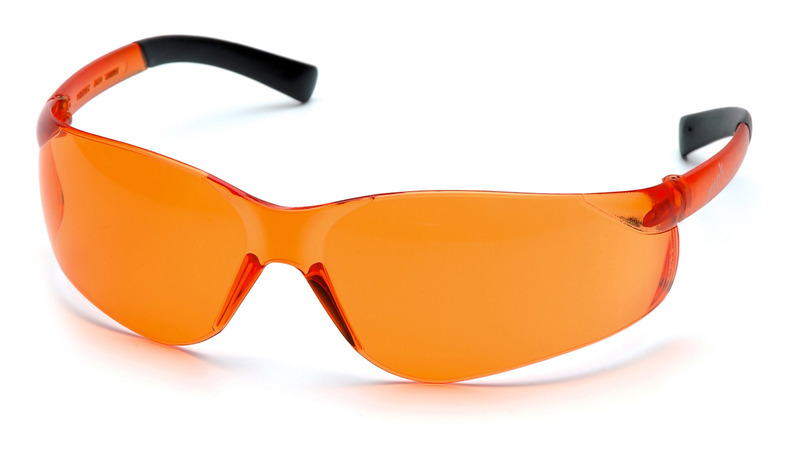 Other types of orange blue blocking glasses which are cheaper may do something similar but they are just ugly. And here is where I recommend Swanwick. If you are the type of person who moves a lot, who goes outside at night and want to have a great sleep get a pair of Swannies. If you spend a lot of time in front of a TV or have some LED, white or any other kind of bad lighting in the house get Swannies. 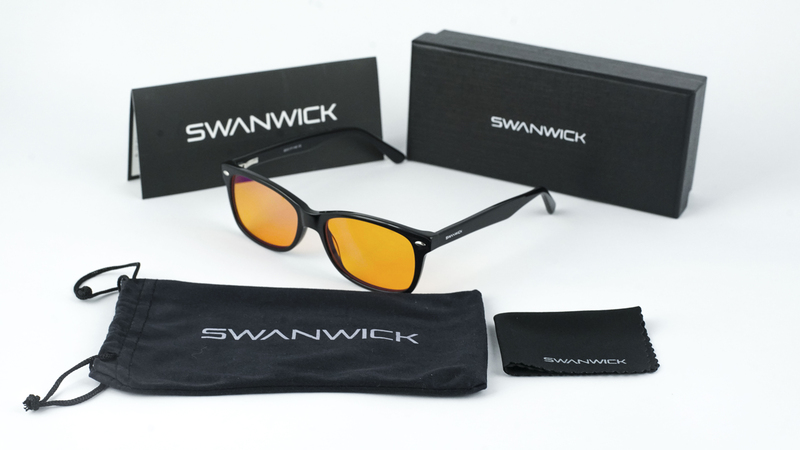 Swannick glasses are the most beautifully designed and effective glasses for blocking blue light. Dr S Eyewear was founded in August 2017 by Dr. Mariana Salmasi. What is interesting about this blue blockers is that they are the first blue light blocking glasses designed by an Optometrist. When I talked with Dr. Mariana that even since she was a child she had this gut feeling that staring into digital devices was harmful. After learning more about the many harmful effects in of blue light in studies she searched for good glasses for blue light blocking. When she tested Gunnar and other brands she saw that the blue light protection is only 40% and decided to try to create a product which can remove 100% of the blue light. She also told me that Gunnar has improved their lenses a lot since back then and it now blocks around 65% but this is still far from perfect. 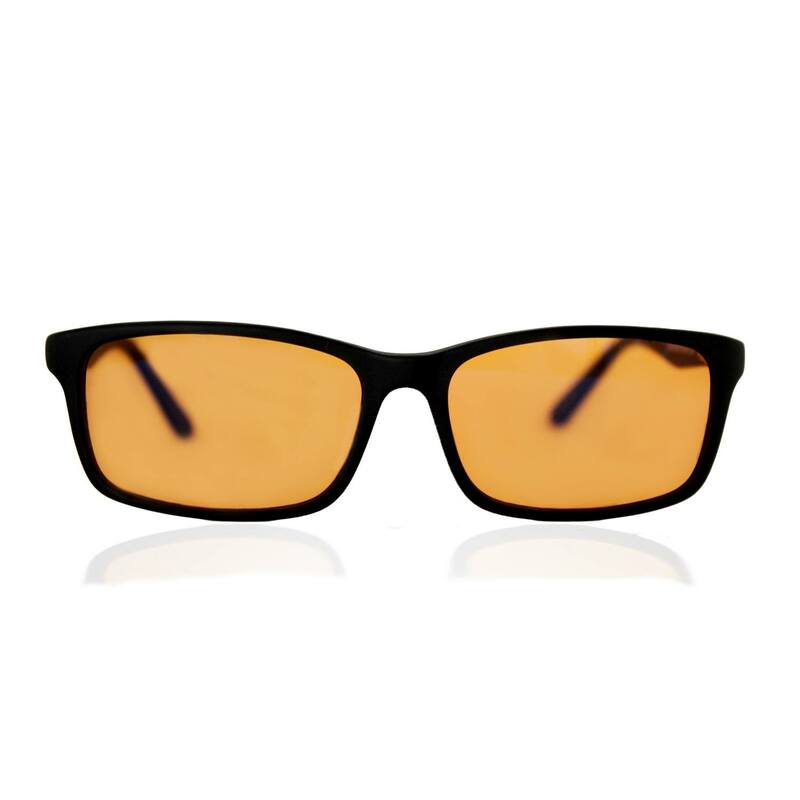 In case you are interested, the newest and best Gunnar lens is called AMBER (BPF 65), you can see it in the picture above. You can also see the old LIQUET (BPF 35) lens which was blocking 35% of the blue light. I’m actually not sure why Gunnar even use this lens. I wrote to them to include them in this article but am still waiting for a response. As I told many times before the more orange or red the lenses are the better. For me personally, red lenses are the best because they block blue and green light or the so-called Cyan color which affects sleep the most. 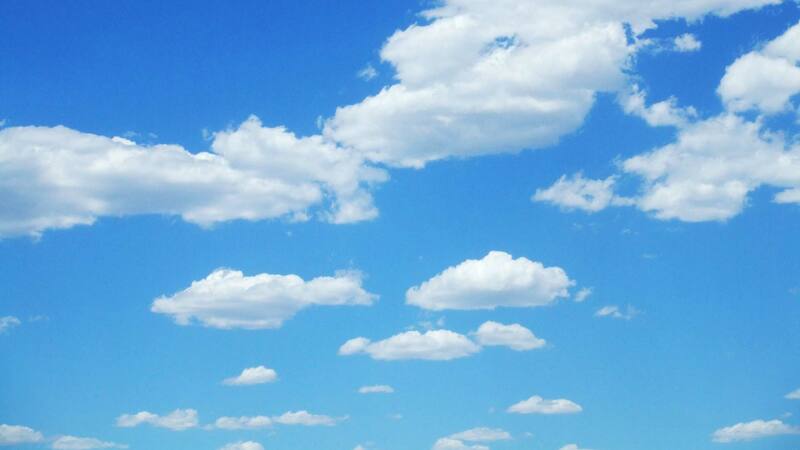 For those of you who don’t know cyan is some combination between blue and green and this is really close to how our sky looks like during the day. Dr. Mariana, however, was super fast to respond to all my questions why Dr S Eyewear blue blockers are the best glasses on the market. 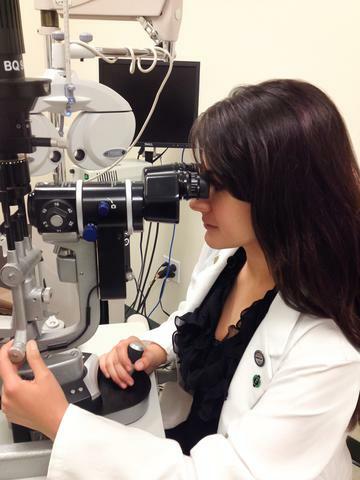 Dr. Mariana Salmasi is a medical optometrist with glaucoma certification. She is also trained in the treatment and management of eye diseases, specialty contact lenses, corneal refractive therapy and the preoperative evaluation and postoperative care of patients. With other doctors, she co-manages patient care for LASIK and cataract surgery. Dr. Salmasi is also certified in therapeutic pharmaceutical agents, lacrimal irrigation, and dilation, as well as certified to diagnose, treat and manage glaucoma. She studied Optometry in the Western University of Health Sciences and have a Doctors degree in Optometry. She also has a Biology science degree from University of California, Los Angeles (UCLA). This is actually what I like about Dr S Eyewear blue blockers. 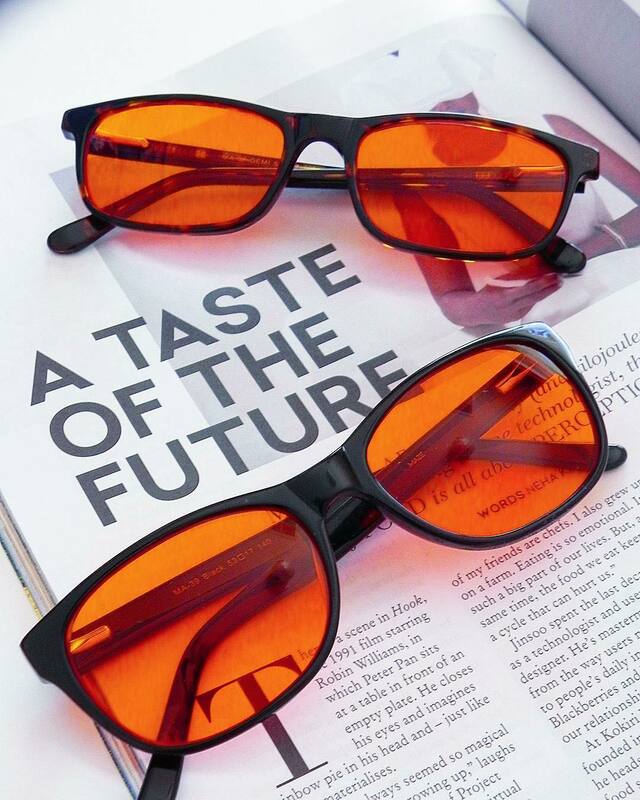 They are not just an ordinary orange glasses which sometimes don’t block any blue light but are actually created by an optometrist. 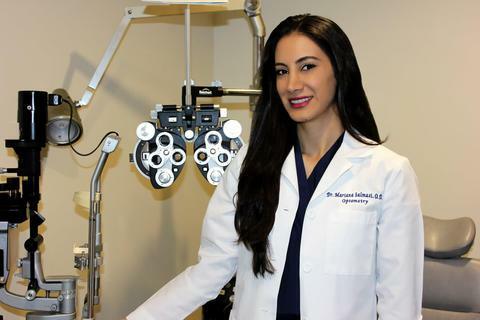 Dr. Salsasi is also full-time eye doctor since 2014 and you can find her in Los Angeles. She is also an avid artist and won numerous awards for painting, sculpting and creating works of art. Her created her first patent was for eyewear in 2013 while still in Optometry School and haven’t stopped creating since then. She told me that she is particularly interested in the harmful effects of blue-light rays that are emitted from digital devices and the quality of the Dr S Eyewear glasses supports this. Mariana told me that she designed the glasses and they are unique to her company. They created the mold and then manufactured thousands of glasses for adults and children. This is actually really big deal because I know that many blue light blocking glasses actually come from China and the lens is some regular safety glasses lens. 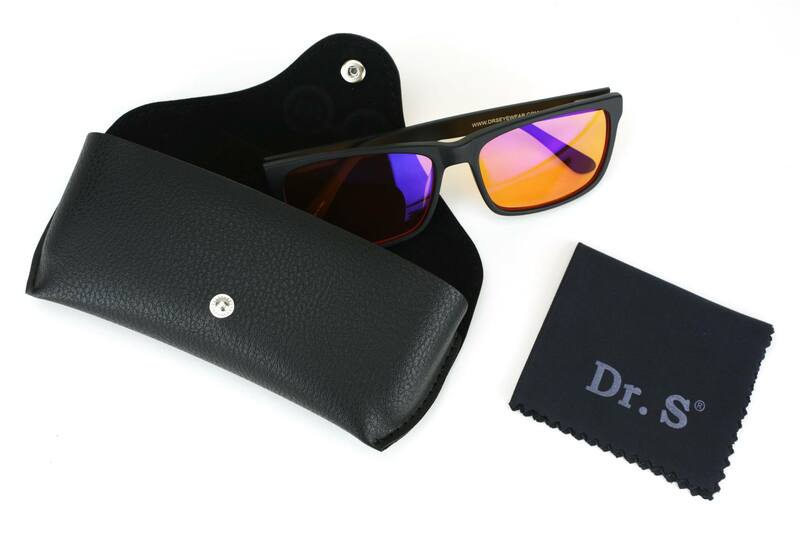 Dr S Eyewear glasses are entirely custom made on the other hand. She showed me also that they block 99% of the blue light. I really appreciate how she said 99% because it actually super hard to remove all blue light with a lens. Most companies which tell that they block 100% of the blue light don’t even come close to 50%. I remember how when I tried to remove all of the blue light with my software Iris I basically almost removed all colors from the screen and also did an inversion. For example here is how the screen looks like when 50% of the blue light is blocked by software. Which even I think it’s too much. Dr S Eyewear blocking spectrum is really good and effective. 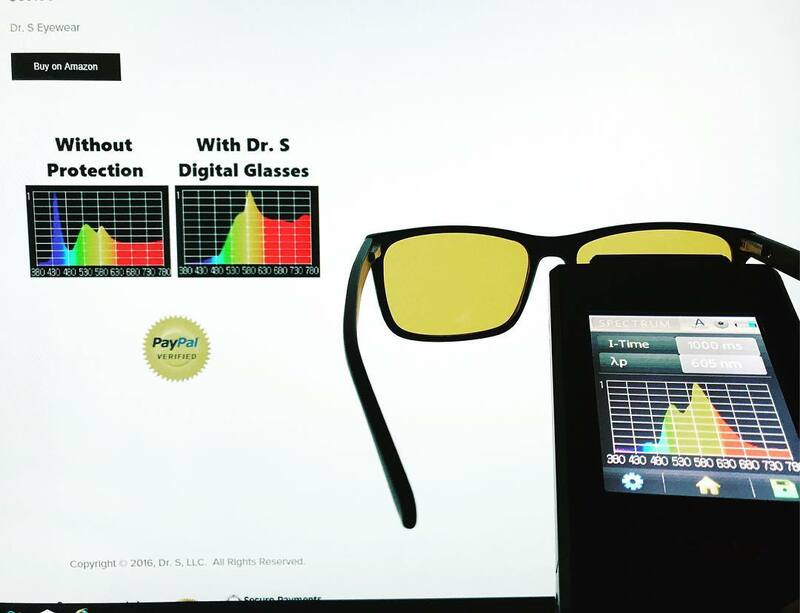 The benefit with glasses over software is that with the glasses you can block all blue light not just from the monitor. You can block the blue light from your TV, tablet, smartphone and the light around you without installing anything. I am a fan of software because of the automation and that it is easier to build a habit but the glasses are much more effective if you don’t just use your PC at night. Children also seem to like glasses more. I also want to add that I am an advocate in childrens’ vision and eye health. Kids nowadays spend more time on smartphones, iPhones and digital devices thus creating possible permanent eye damage. In addition, increased near activities are contributing to nearsightedness (myopia) which means they will likely need glasses. We need to educate parents. Parents are worried about their children’s digital device use and always ask me if it is harmful. I totally agree with this. We need to spread the word about the harmful effects of blue light and protect ourselves. It doesn’t matter if you are going to use glasses, screen protectors, software or whatever you choose. If you just decide to spend more time outdoors to get more full-spectrum sunlight it will also be great. But more and more people need to know about the dangers of blue light and LED lighting in general. I talk also a lot about the dangers of PWM flicker but still, there are really a few people who think that blue light can harm them in the long run. 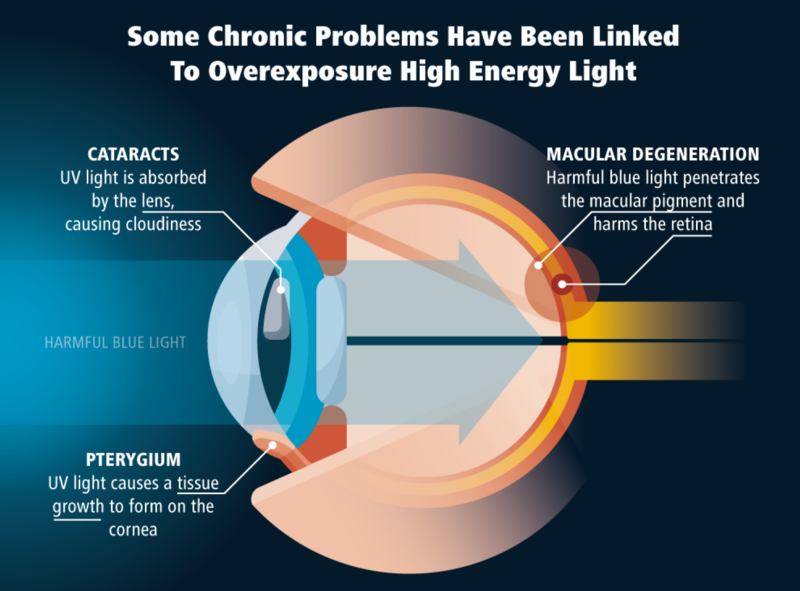 Studies show again and again that blue light causes macular degeneration after prolonged exposure. It also changes our circadian rhythms and kills our sleep. 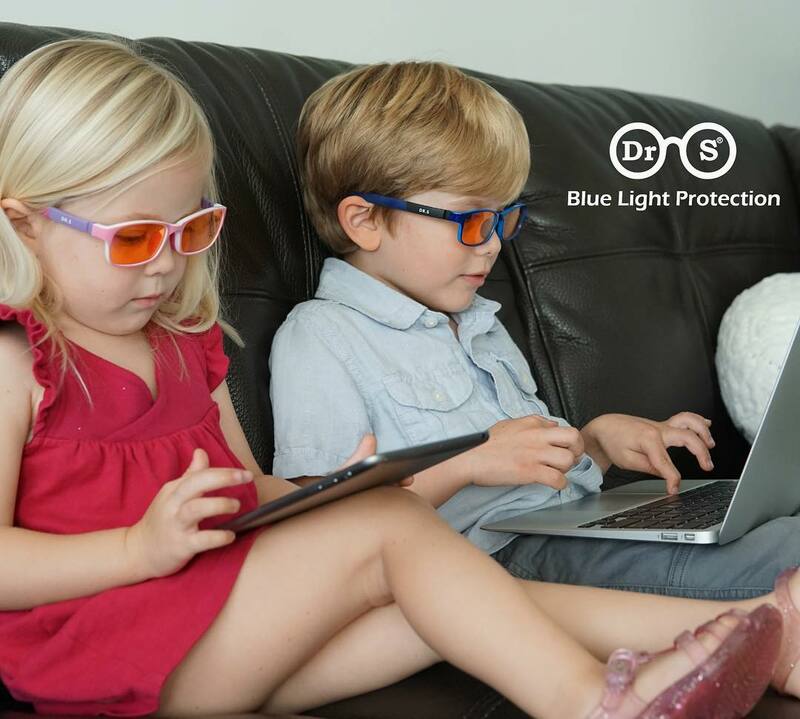 If you spend a lot of time in front of the TV or have LED lighting in your home get some blue light blocking glasses. 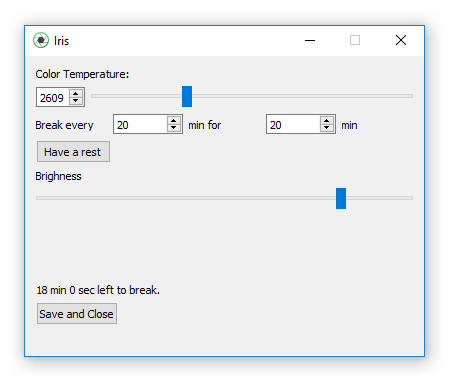 For PWM and subpixel flicker from the computer and automation of the blue light reduction on your PC you can also try Iris. I really recommend Dr S Eyewear glasses for several reasons. They are one of the few glasses which actually have some measurements on them and block all blue light. Dr S Eyewear glasses are one of the few blue light blocking glasses actually designed by an optometrist with a lot of science in them. 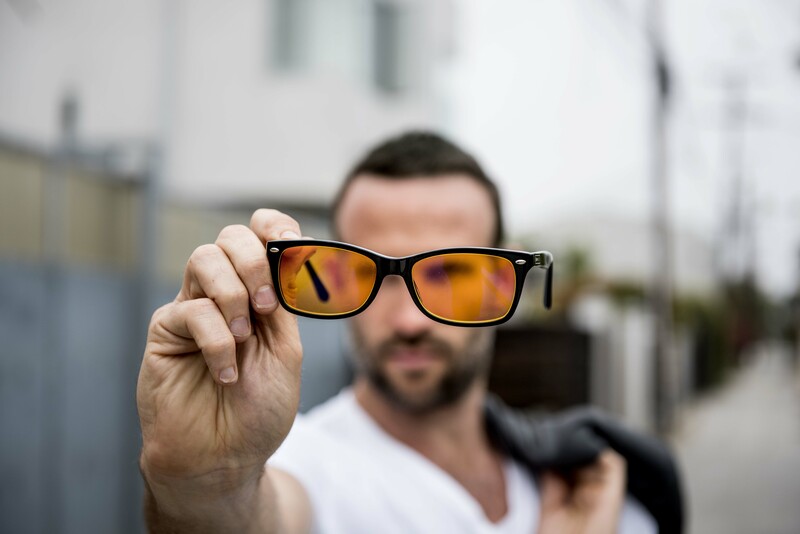 They are proven to block 99% of the blue light and really effective and have also anti-reflective coating and UV protection. What I like about BLUblox is the huge variety of lenses which they have and that they actually have red lens for night usage which blocks both blue and green light. At first glance you may think “Why do I need to use different lenses?” and I want to spend some time to explain the reasoning behind using different lenses during the different parts of the day. During the day, you actually need full spectrum sunlight to be more healthy but the light from monitors and other light sources are different from the light of the Sun. 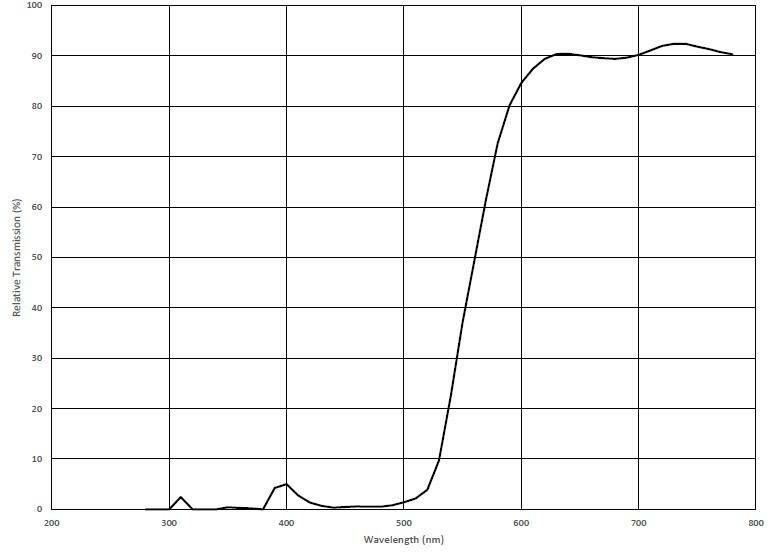 The first graph on the picture above shows the light spectrum from the Sun and the next 3 graphs are from different light sources. You probably know that red light causes growth and blue light decreases growth, red light promotes health, while blue light most of the time is degenerative. 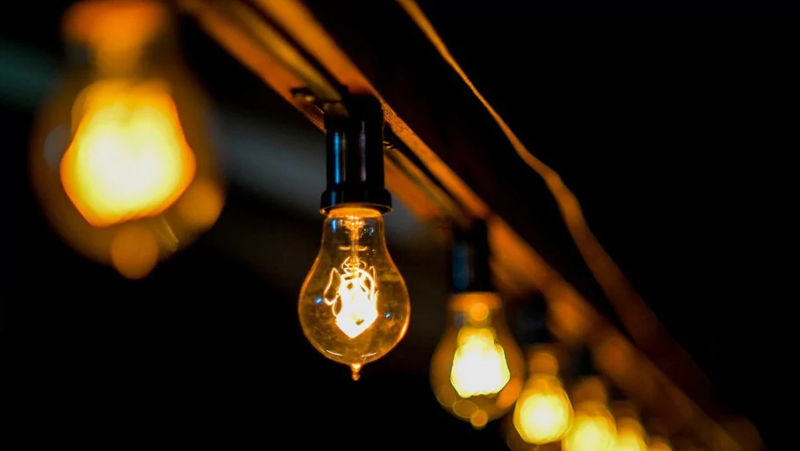 The first lightbulb which Thomas Edison made was actually really healthy lightbulb because it emitted mostly red light and a little blue light. We know this light bulb as Incandescent and it creates light mostly by generating heat. This is why it’s not energy efficient and emits a lot of red light. The more energy efficient the light bulb the more blue light it emits most of the time. So I’m telling you all this because almost all modern energy efficient light bulbs are LED and they emit a lot of blue light. Looking at the picture of light distribution again you see how different is LED light from Sunlight and why it’s actually not normal to look at monitors or use LED lighting not only during the night but also during the day. Computers, TVs, Cell phones, Tablets and all sorts of lights around us emit harmful blue light and this is why I and so many other people recommend blocking blue light even during the day. 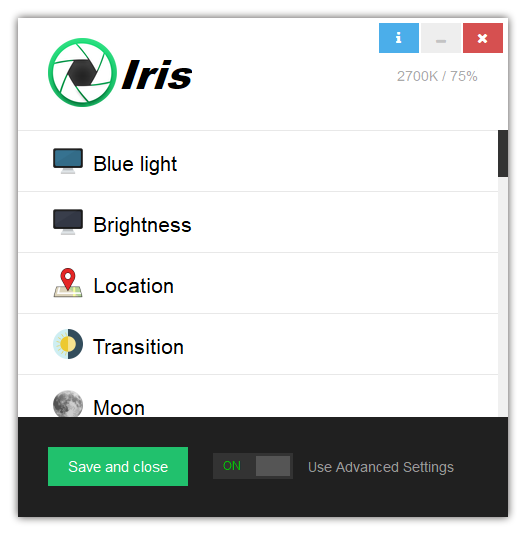 If you use Iris on your computer you may have noticed how even during the day there is a small blue light reduction exactly for this. This is intentional to try to make the LED light more like the Sunlight by reducing some of the blue light during the day. But Iris doesn’t work on everything. What about your TV? What about your tabled, phone or all other blue light emitting devices. What about all these LED lights around the house? This is where the blue light blocking glasses are the only alternative and this is why you need to get BLUblox. BLUblox is a relatively new company but what makes the project unique is this huge variety of lenses suitable for the different parts of the day. I don’t know other company which manufactures both day and night lenses. Most companies focus only on blocking blue light or on the eye protection with not so stronger lens and an anti-reflective coating. What makes BLUblox unique is that they cover everything. From lens to use when you sit in front of some device during the day to blue blocking day lens and finally deep red lens which blocks all blue and green light for night time usage. Aside from the lenses, BLUblox has also a huge assortment of sizes and shapes which is also really unique to other companies which manufacture blue blocking glasses. Andy and Katie Mant founded BLUblox in 2016 with the mission of supplying the most optimal blue blocker glasses in the world. Andy told me that they started wearing blue blockers after dark in 2015 but they saw only minor improvements in their sleep. We purchased our first blue blockers from a popular brand in the US so we wanted to know why we were not getting perfect sleep by wearing these blue blockers, as the company claimed. Then we found the answer, some studies were showing that not just blue light but green light up to 550nm was negatively affecting our sleep. 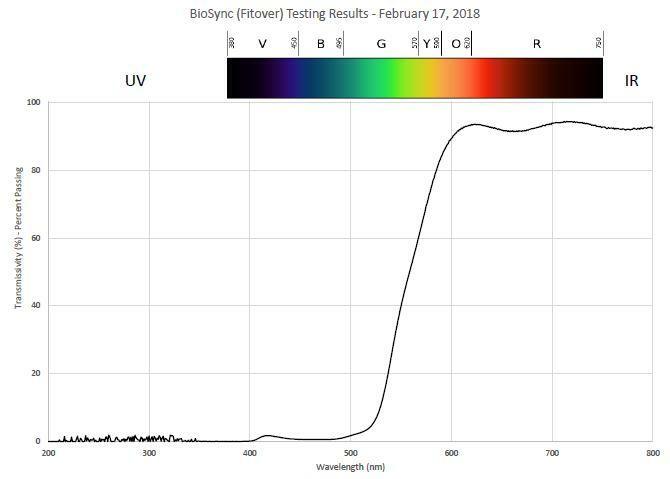 We set to work in our laboratory and created a red lens that blocked all blue and green light from 400-550nm, in line with the latest science, called Ultra550. The first night we wore our prototype pairs we slept right the way through the night and woke up feeling refreshed and full of energy. 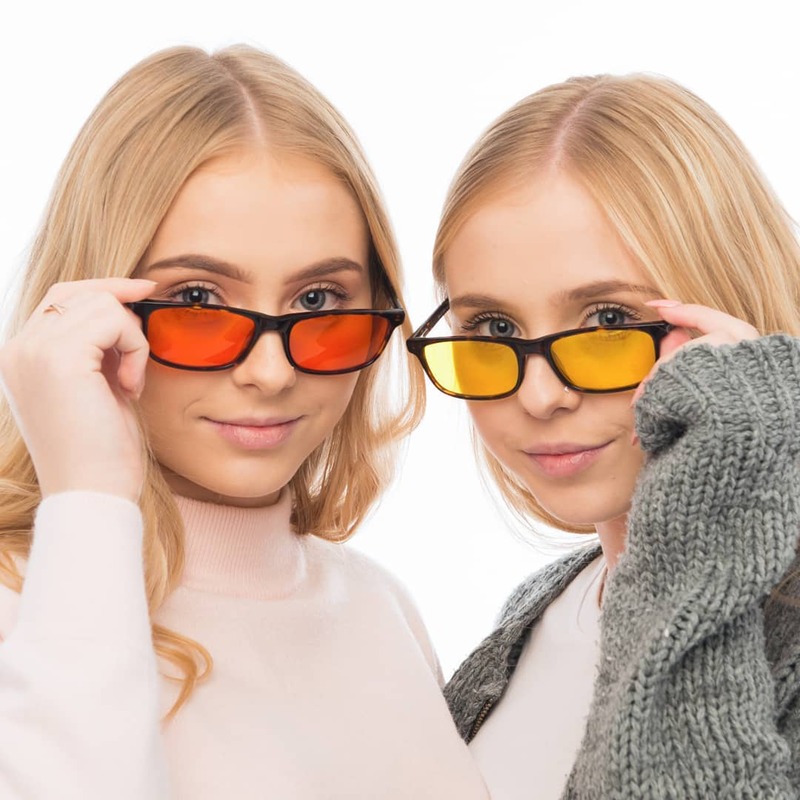 We knew we had just created the most effective blue and green light blocking glasses ever made and we wanted to share this product with the world. ​We both work in office jobs, not a good environment as we are exposed to LED lighting overhead, LED computer screens and LED screens from our smart phones. 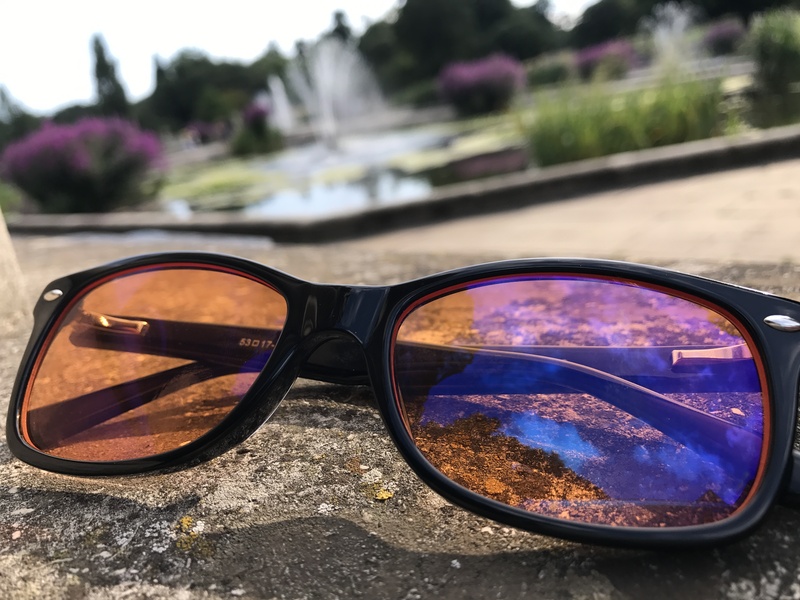 Even though our night range of red lenses were giving us a fantastic sleep we knew we had to address the digital eyestrain and headaches we were suffering from exposure to blue light during our office jobs during the day. We tried a few popular brands and some cheap computer glasses from eBay but nothing improved. Then we discovered a post by a popular scientist who showed the light spectrum of LED lights. Then in clicked, we had to block the nasty spike in blue light around 450nm, so obvious but none of our competitors were doing this. So, we set about making two prototypes; a clear lens impregnated with an advanced blue light reducing material, which reduced the blue light spike from LEDs down, and a yellow pair which eradicated blue light from 400-450nm. Being in an office environment we both tried out the clear pair and we were amazed how fresh our eyes felt and we did not have any headaches after working on our computer for 8 hours. We had a colleague in our office who suffered from frequent weekly migraines, so we lent her our pair of yellow tinted Ultra450 lenses to trial for a month. To this day we have not had them returned to us because they eradicated her migraines whilst working on computers in the office so we let her keep them, we felt so humbled. With the lenses sorted we set to work designing frames that were in line with the latest fashions, making blue blockers more socially acceptable to wear and comfortable on your face. You would not wear safety goggles to work or to dinner after dark, so we fixed that we ultra-sleek and stylish frames, with styles to suit everyone. Did we also mention that unlike our competitors whose glasses are made in China BLUblox glasses are designed and made in Australia? This guarantees a high-quality product that does exactly what it promises. 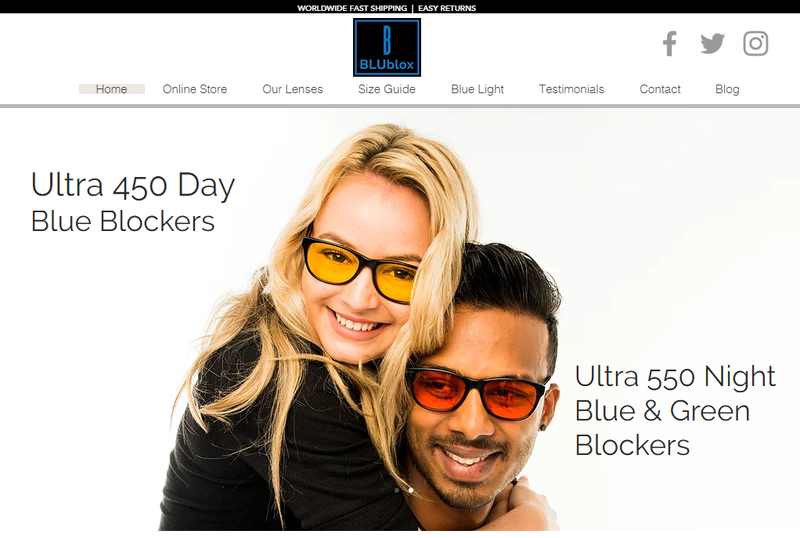 Since launching BLUblox we have sold thousands of pairs of our blue blockers not just to people who wanted their first pair of blue blocker glasses, but to many people wanting to upgrade from their cheap amazon and eBay pairs and even from some of the other popular brands out there. 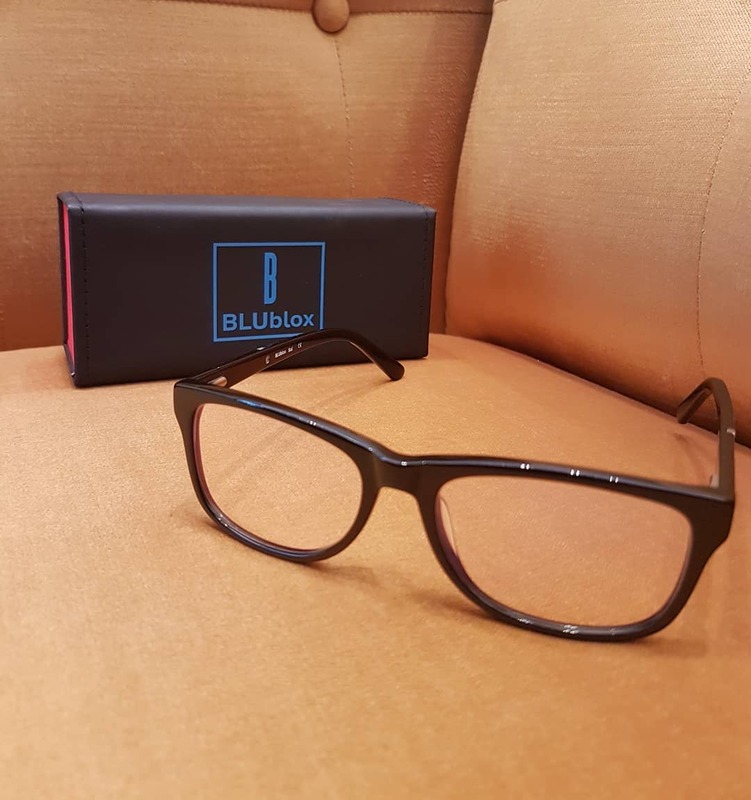 We have had many wonderful testimonials about how our glasses have improved the lives of our tribe who have trusted in BLUblox to give them their sleep and health back. The thing I love about BLUblox is that the team actually use and sell a red lens for night time usage which blocks all blue and green light instead of some yellow or orange one. As I told many times before yellow and orange lenses don’t block the green light which also has an effect on our melatonin secretion at night. Blue and green light after dark from the 400-550nm range suppresses melatonin production and disrupts your sleep. BLUblox Ultra550 red lens block 100% of this range meaning zero sleep-disrupting blue and green light passes through their lenses. While amber lenses only block some blue light and no green light the red lens of BLUblox blocks everything. It’s clear that you must block all light that disrupts your sleep or your sleep won’t improve much. BLUblox Ultra450 yellow lens are super useful at daytime to make the light emitted from LED digital devices more like the sun. 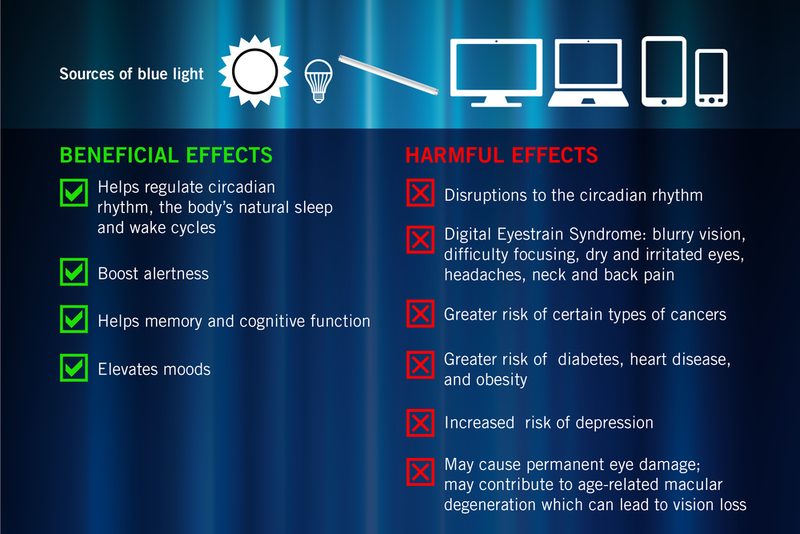 It has been proven that excess artificial blue light damages your eyes during the day. The range of light that does the most damage is between 400-450nm. 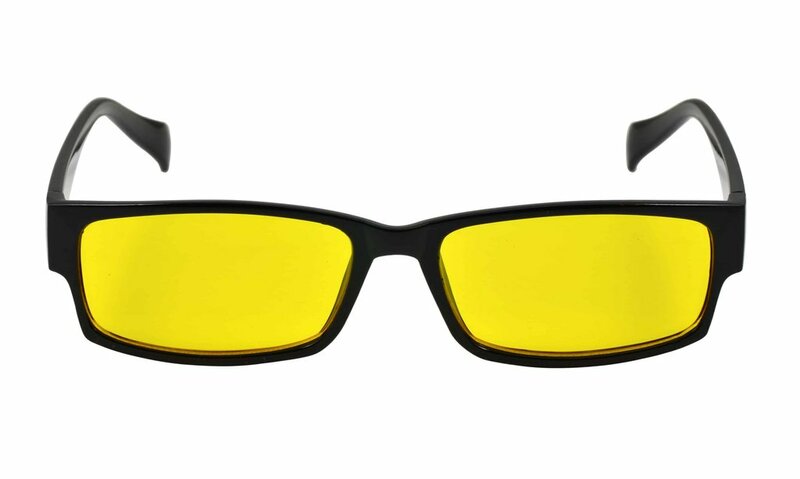 BLUblox yellow lenses block 100% of the eye-damaging blue light in this range. Matt Maruca created Ra Optics in 2017 because all effective blue light blocking glasses were pretty unattractive. The good looking blue blockers were not blocking much of the blue light and the ones that actually worked were made for the safety of workers and looked pretty ugly. What I love about Ra Optics is exactly this red lens which is super effective for blocking all blue and green light. As I have said many times the yellow and orange lenses most of the time don’t block all blue light or if all blue light is blocked they do nothing for the green light which is emitted from the artificial light around us. The latest medical researches point that light up to 550nm suppresses the secretion of our sleep hormone melatonin and actually, Matt showed me something even more interesting. 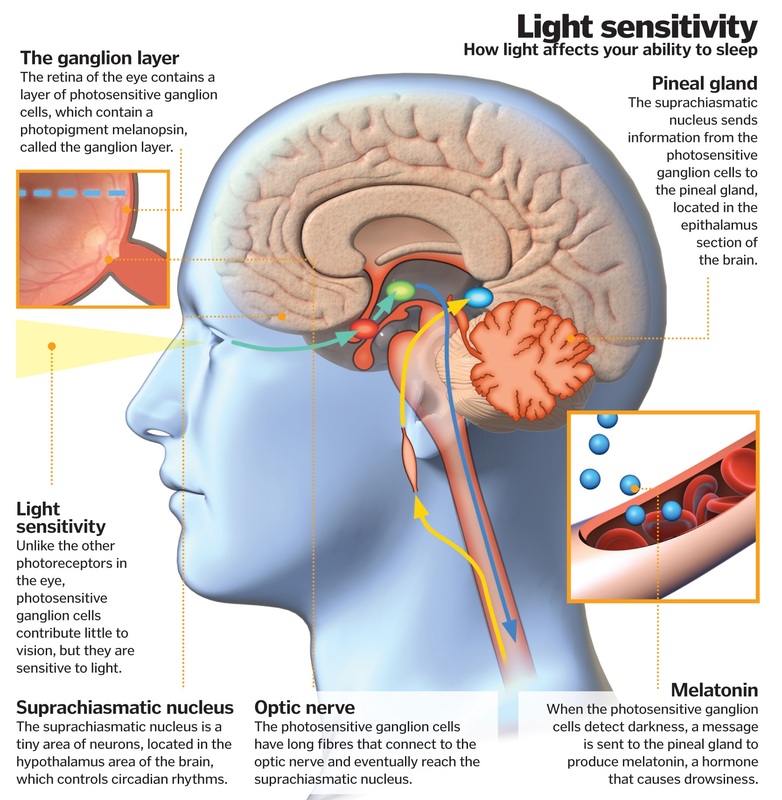 There is also evidence that even the healthy red light can cause some melatonin suppression. 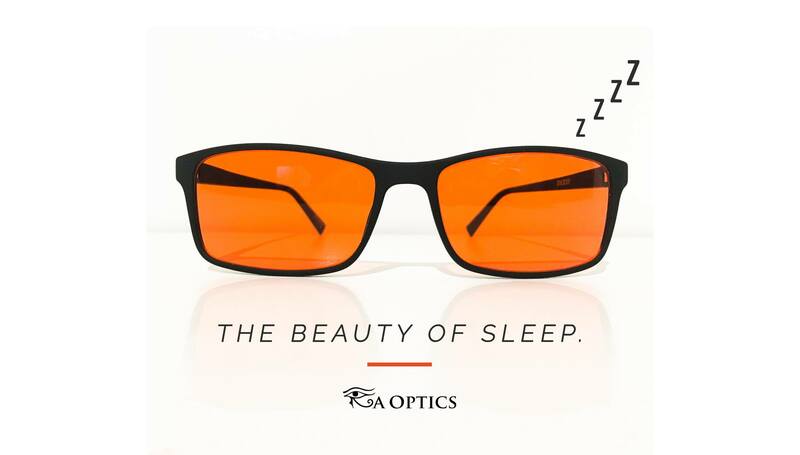 I guess we just need to turn off all lights before going to sleep and what I love about the whole team behind Ra Optics is that they are experts in light and photobiology. Another awesome thing about Ra Optics is that they manufacture both Daytime and Nighttime lenses and you can customize everything. 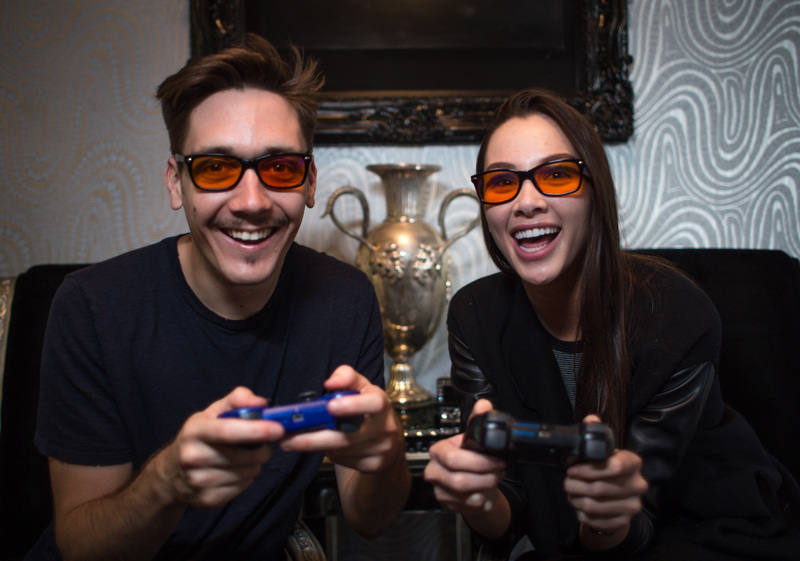 You can even send your own glasses and the team will place you the perfect lens which can block all blue light. This custom tinting service is actually unique and no other company offers you to send your own frames and Ra Optics will make you a new lens and send the frame back to you. I’m not going to go into many details again why the red lens is important for night time use and why you also need some blue blocking during the day but Ra Optics offer everything. A great lens which blocks all blue and green light up to 550nm and great daytime lenses which block blue light up to 450nm. In a perfect world, we would not need blue blockers. In our world, it would be ideal for most people to have both, but it depends on your lifestyle. 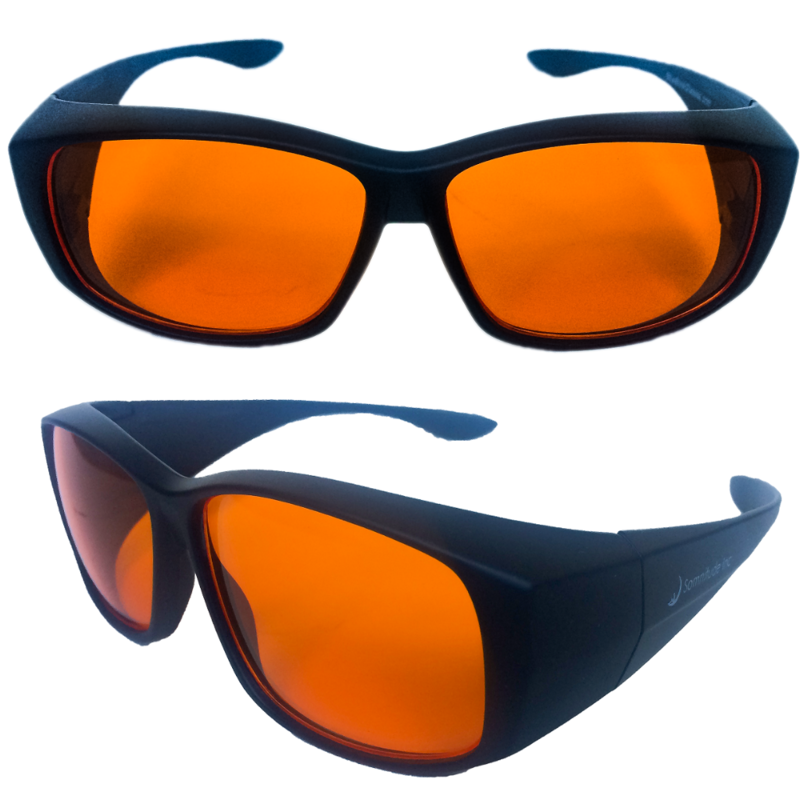 Nocturnal Red lenses block all light wavelengths up to 550nm. 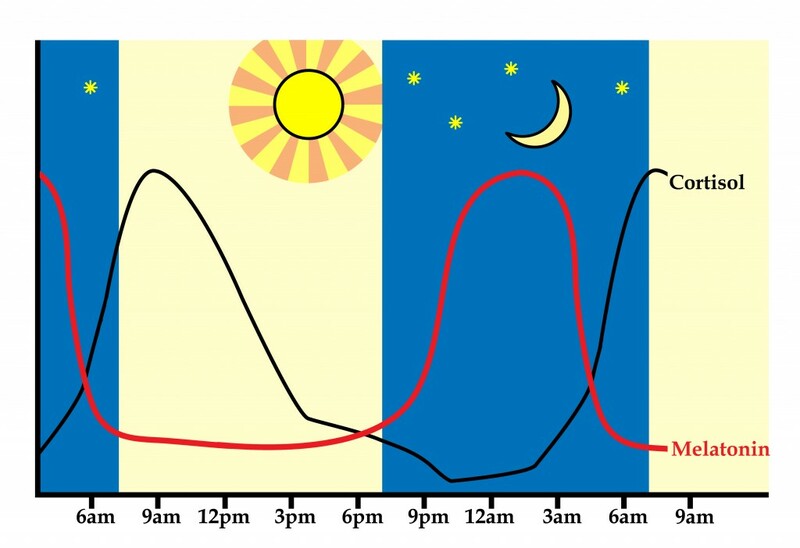 These are the wavelengths shown to most affect our “biologic clock”, lowering melatonin levels and altering our sleep/wake cycle when present after sunset. This is because our body is designed to be not exposed to them after dark. 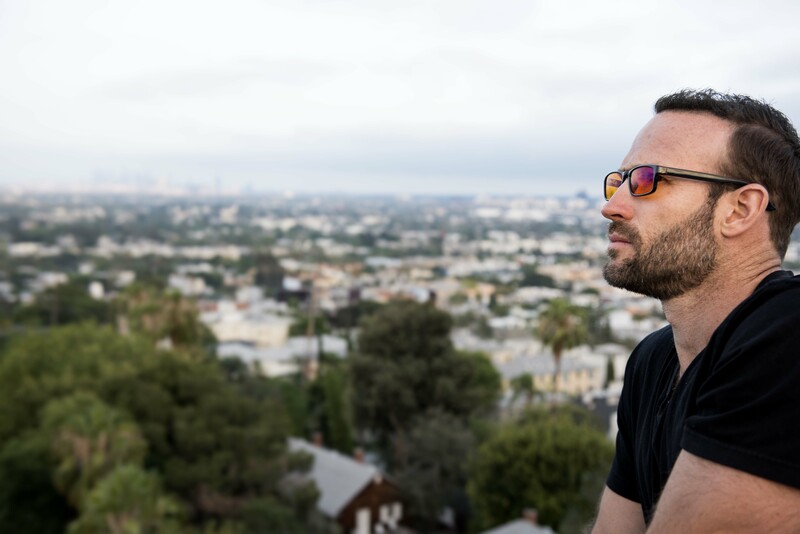 Everyone who does not live alone in the forest or ever leaves their house should have a pair of nighttime blue blocking glasses; our are ideal because they are the most attractive on the market, making them something that will be used on a consistent basis without hesitation. These blue blockers can also be re-purposed for temporary daytime use if you enter someplace like a Target, Walmart, or Grocery Store. Daytime Blue Blocking Glasses are for people who spend most of their day indoors under artificial light, which means most people. 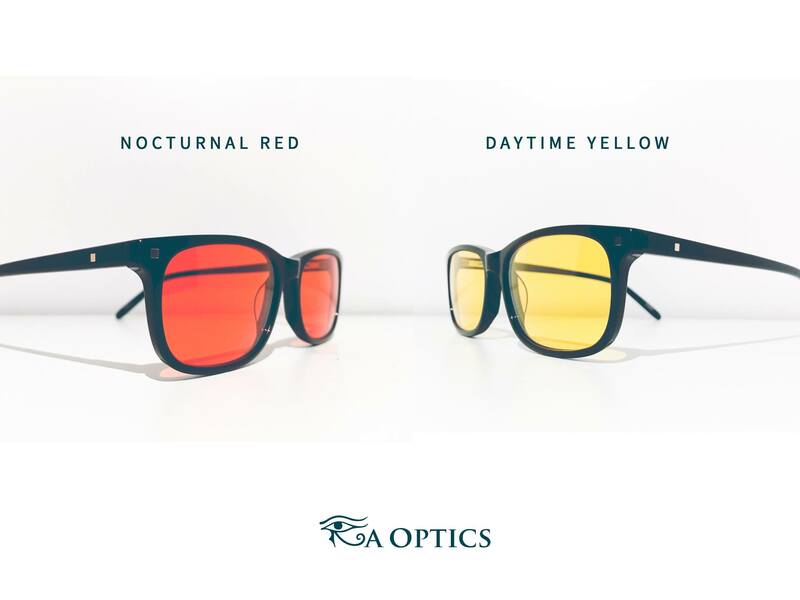 The reason we have a different tint is that it is not only not necessary to block all blue light during the day, as our Nocturnal Red lenses do, but it is functionally a new mismatch, telling the brain that it is nighttime, more or less, when it is not. Some may argue that, because almost all artificial light itself is already a “mismatch”, it is better to block all of the harmful blue light than to block none of it. 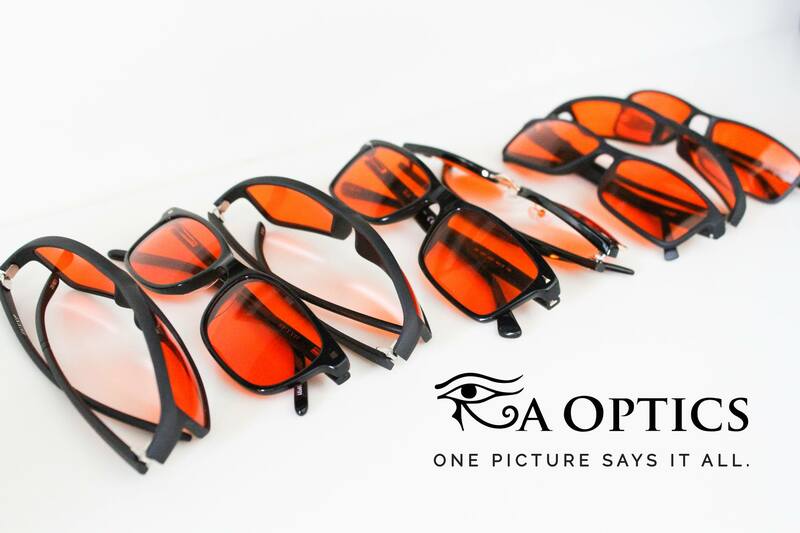 I strongly recommend Ra Optics and especially the custom tinting service which is the only one in the world right now. When I wrote to BlueBlockGlasses they provided me so much useful info that I’m going to first share it with you unchanged. After this, I’m going to give you my thoughts about the product and why you should choose BlueBlockGlasses. Sleep is essential for survival. Your brain is responsible for making you feel sleepy in the evening and keeping you asleep during the night. To do so, it has two processes that regulate sleep. The first is called the homeostatic process. This is the pressure to sleep that accumulates throughout the day. The second is the circadian (circa: “around” and diem: “day”) process. This regulates when you fall asleep and wake up. These two processes work to ensure a good night of sleep. 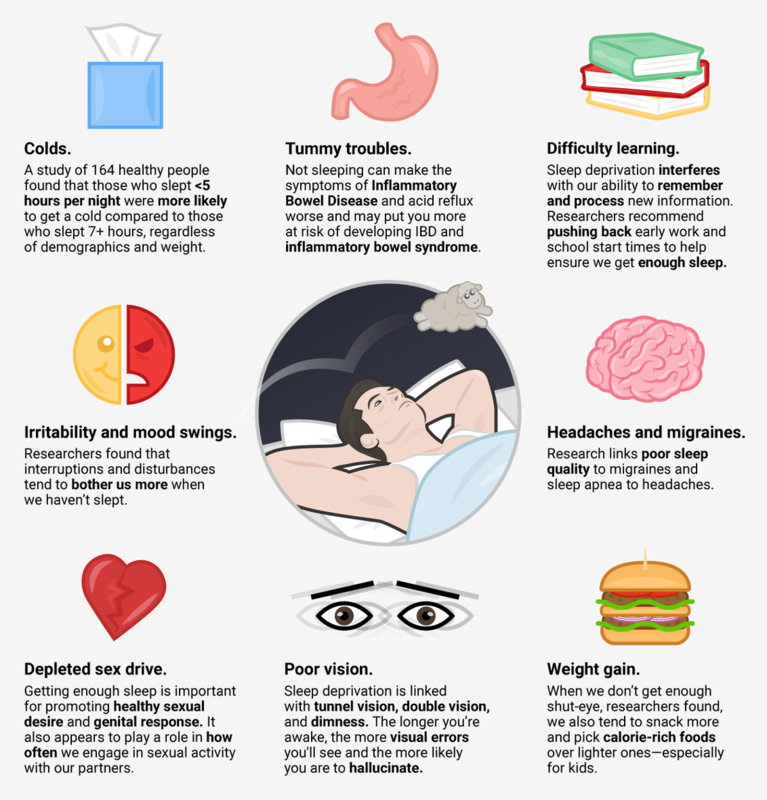 Poor sleep has many consequences; some are decreased alertness, altered mood, and impaired memory. Long-term sleep deprivation has been linked with diseases such as diabetes and cancer. One strategy to ensure a good night of sleep is to strengthen your circadian signal of sleep and wakefulness. 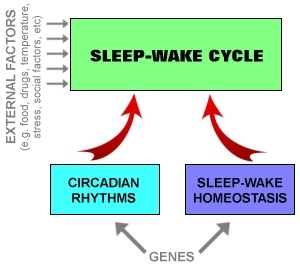 The circadian clock is kept in sync by environmental inputs. The most important factor is the blue component of light. The presence of light in the morning signals day time, and the absence of light in the evening signals night. Special cells within your eyes detect blue light (wavelength 440 – 480 nm) and send a signal to your circadian system. Historically, humans were exposed to blue light during the day (from the sun) and not exposed to blue light at night. Our circadian systems are geared to anticipate this pattern of light exposure. 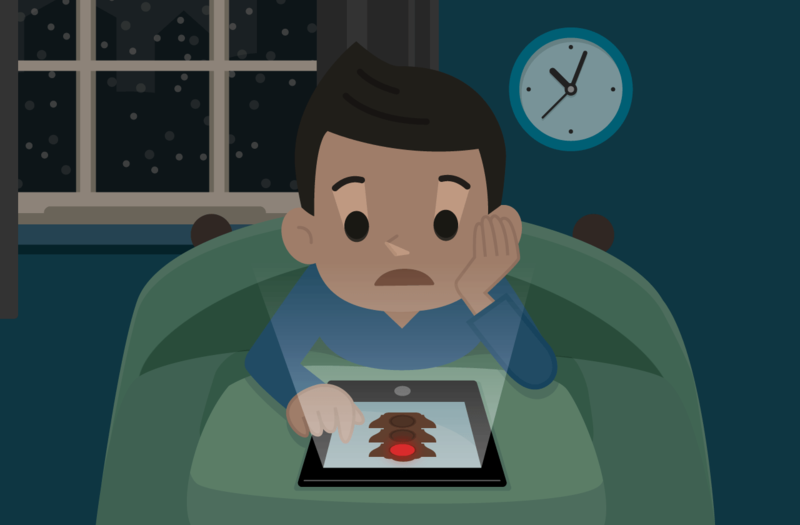 Today, however, blue light exposure in the evening is very common, either because of screen use before bedtime or simply because the lights are on in the house. Lights in living areas and washrooms usually have some blue component. Blue light at night tricks your circadian clock into thinking it is the day, and prevents you from preparing for sleep. More specifically, blue light suppresses the release of a hormone called melatonin. Melatonin is secreted and transmitted throughout your body in the evening to signal night time. A delay in the release of melatonin, due to light exposure may result in delayed bedtime, sleep onset insomnia or poor sleep. Eliminating electronic devices and lightning exposure before bedtime would improve sleep, but it is often unrealistic. It is furthermore not necessary to cut off all of the light because the circadian clock is blind to most colors. This is why Somnitude has developed specialized sleep promoting glasses that selectively block harmful blue light while allowing other wavelengths of light to pass. 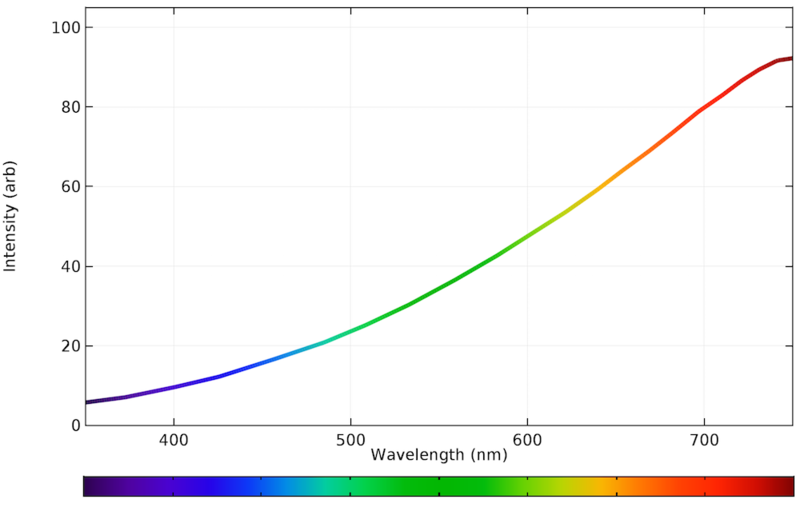 The glasses filter 99% of full spectrum blue light (spectra light until 520 nm). Somnitude’s Blue Block Glasses allow you to pursue your regular activities in the evening, without having to worry that your circadian clock gets confused because of the surrounding light at night. The glasses are ideal for those who use electronic devices in the evening or those who have problems with waking up on time. The glasses are made from an optical grade polycarbonate, infused with a blue absorbing dye. 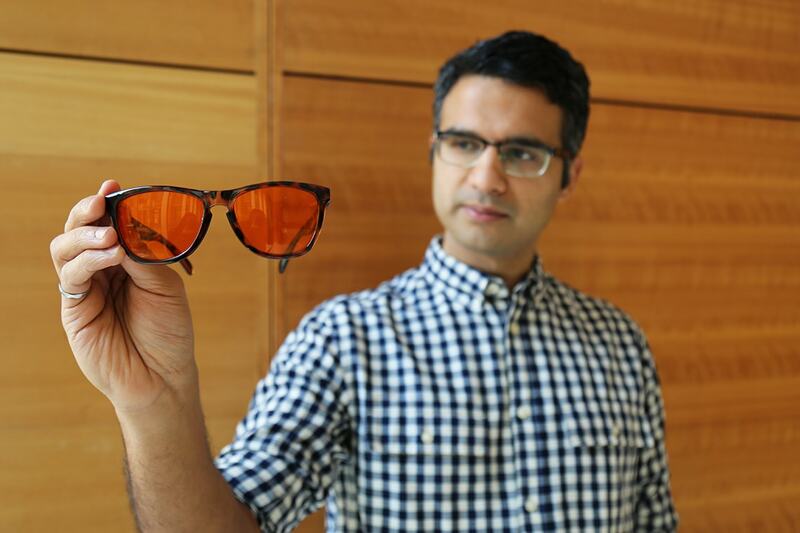 The material is simple, yet durable and the glasses can easily survive being dropped. The various styles allow for wearing of prescription glasses or not. The glasses are tested at the University of Toronto’s Institute of Optical Sciences and were used by members of Team Canada at the recent winter Olympic Games. Somnitude’s Blue Block Glasses have also recently been approved as a Medical Device by Health Canada and are now being used by sleep physicians to help those who have certain sleep disorders, such as Delayed Sleep Phase Syndrome. We often get asked – What’s the difference between Somnitude and other brands? The main difference between our glasses and those filters provided by Warby Parker, Gunnars etc. is in the degree of filtering and width of the spectrum of filtering. Most other providers will filter a lower amount (for example 40%) at a smaller spectrum (440 – 470 nm). These types of glasses are typically intended to be worn during the day, to prevent against eyestrain. 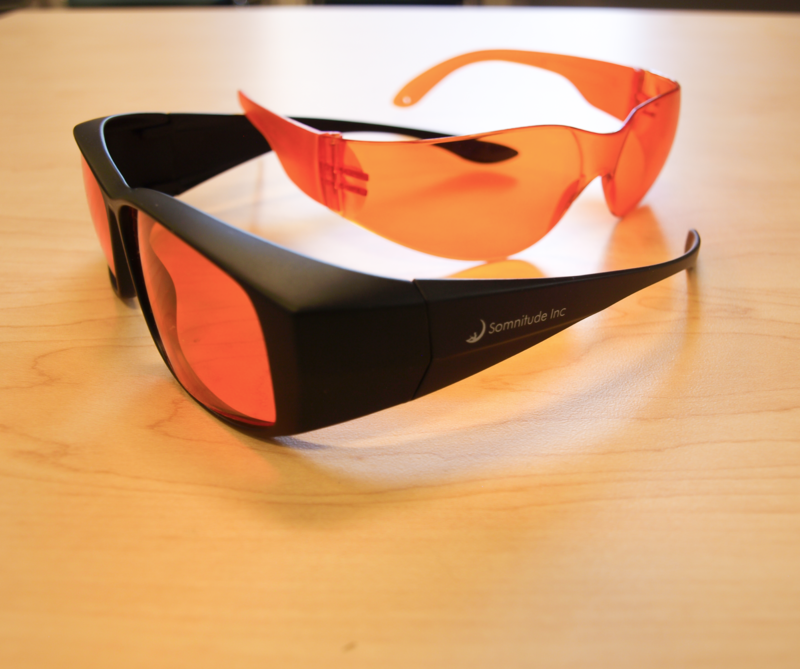 On the other hand, Somnitude’s glasses filter 99% full spectrum blue light and are only recommended for evening wear. Another important consideration is the effectiveness of the blue filter. For the untrained eye, it is almost impossible to detect how much blue is actually being filtered. Many brands will claim things like ‘Full blue blocking effectiveness’ etc. but then fail to provide testing results or details on the company. The only way to test effectiveness is by measuring the spectral transmissivity using a spectrometer. 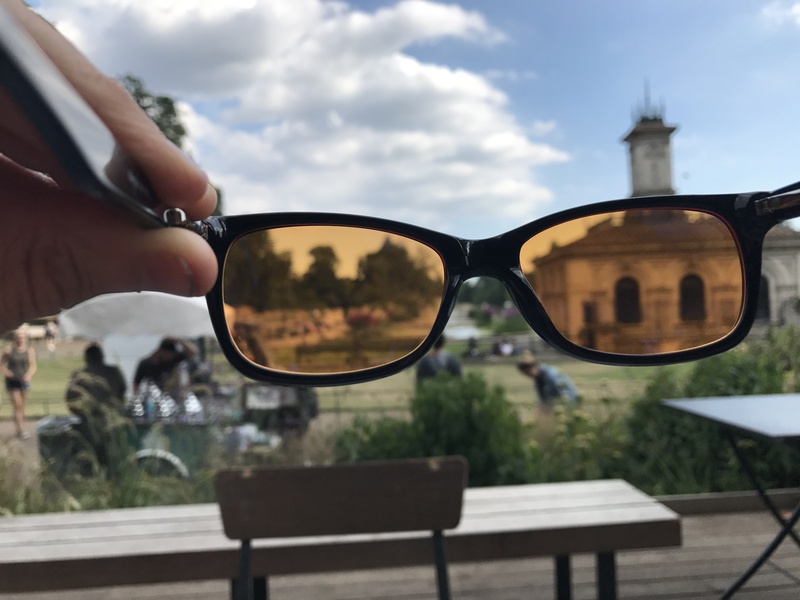 Because we are affiliated with the University of Toronto we conduct rigorous testing on all our glasses to ensure that they are designed and manufactured to the specification of 99% blue light filtering. I decided to share the info that Somnitude provided me because they included so much useful and unique info but here are my thoughts and the things I think that are missed in the text above. 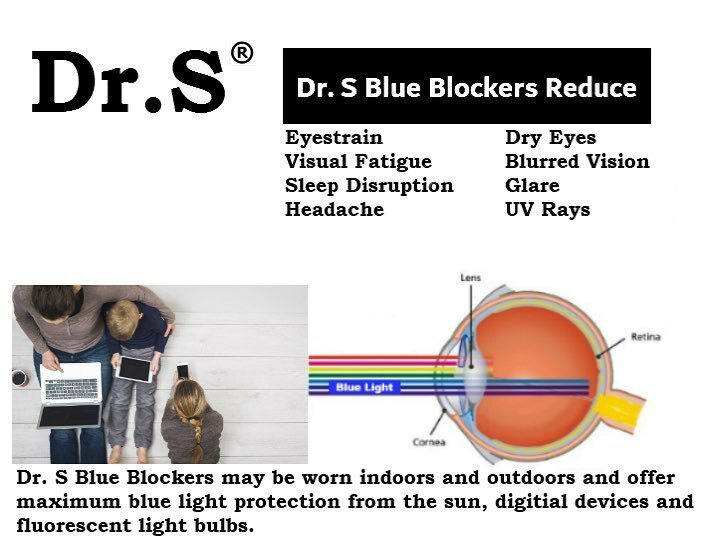 What I love about BlueBlockGlasses are they are a cheap and effective solution and effective solution for blocking all blue light. I also like that they actually provide measurements for all their glasses not just talk about blocking blue light. 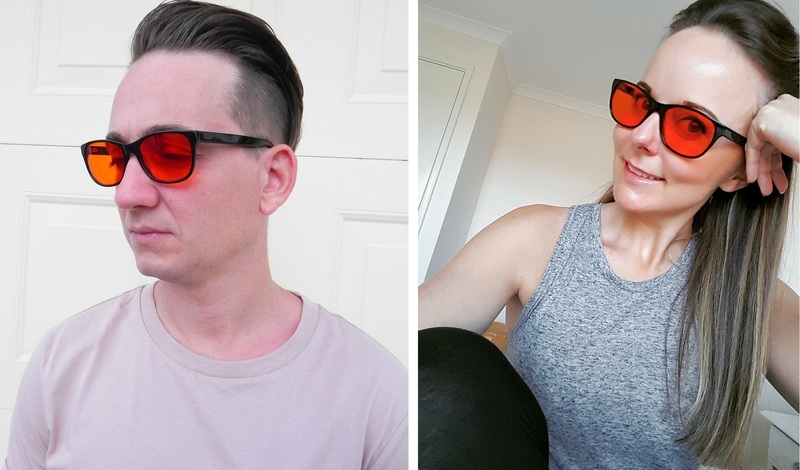 While other brands glasses may look better than some of the Somnitude glasses styles, BlueBlockGlasses are the cheapest option and they also cover the entire face. What I mean by covering the entire face is that there is no place for the blue light to enter your eyes because they have Fitover glasses. One thing that maybe they can improve in the future is to make also a red lens which can block green light also as we talked before. 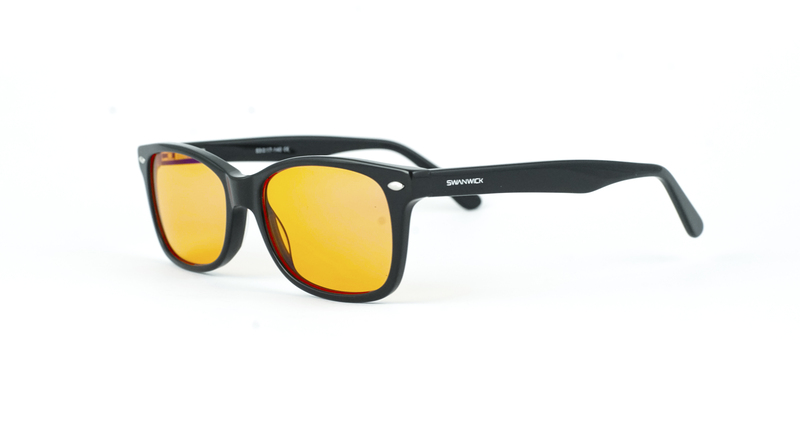 Consider buying this glasses if you are from Canada and if you want to have Fitover glasses. BlueBlockGlasses have a great price and work great for blocking all blue light. While everything can be effective for blocking blue light, my personal favorite way is by using a blue light filter app. I guess this is also maybe the reason why I created Iris in the first place. The good thing about a blue light filter app is that most of the time it’s super customizable. For example with glasses and screen protectors, you need a different kind of lenses and sheets to block different parts of the light. With Iris and apps like it, you can just move one slider and regulate how much blue or green light is blocked which is really cool. You also have automation which means that during the day you will get a small blue light reduction and during the night it will be much stronger. This helps to build a habit of blocking blue light easier. With glasses, you may forget them and the sheets block light all the time which may not be what you need. I will try to present and compare all different blue light filter apps here. As you can guess I’m a little biased towards Iris but I will try to explain why I believe it’s the best software for eye protection. 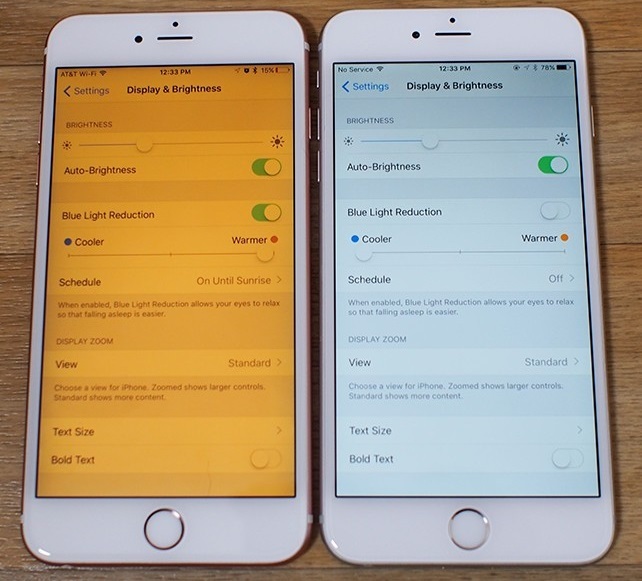 Big companies started to create native solutions for blue light reduction from the beginning of 2017 and these settings are a really popular choice for a lot of users. However, as everything integrated into the operating system it’s not working perfectly for specific needs like improving sleep and better eye protection. The reason is not that the filters don’t block blue light, but they either don’t block enough blue and green light for better sleep or are not automated enough to match to screen brightness to the light around you and this makes them inefficient for eye protection. 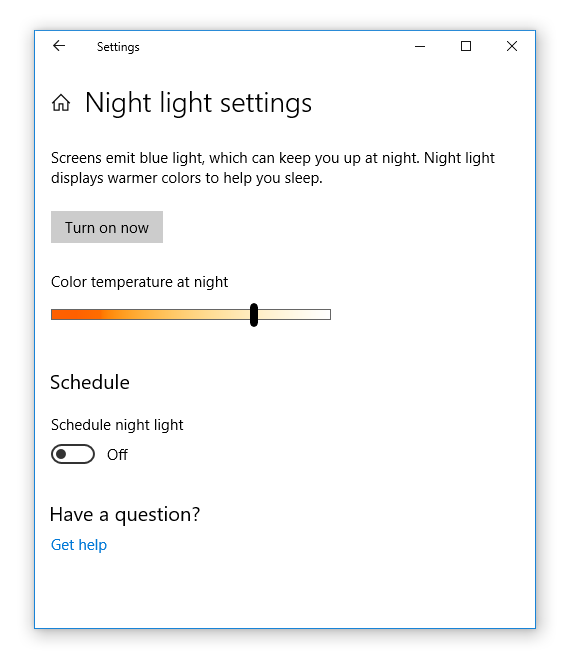 After Apple introduced Night Shift in order to try to make an integrated into the OS way of lowering the blue light Microsoft also added a feature called Night Light in their new build of Windows 10. 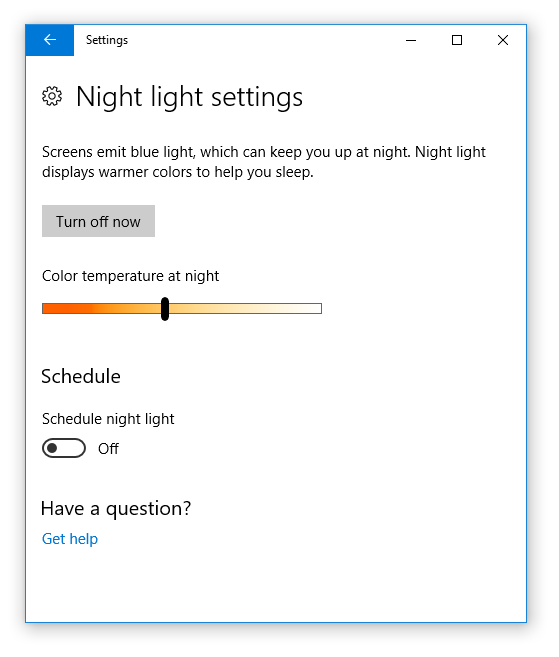 If you have the latest version of Windows 10 you will probably find Night Light in the settings. However, if you use Windows 8, Windows 7, Windows Vista, Windows XP or Windows 10 which doesn’t support blue light reduction getting a blue light filter software like Iris or some other third-party program may be a good idea. 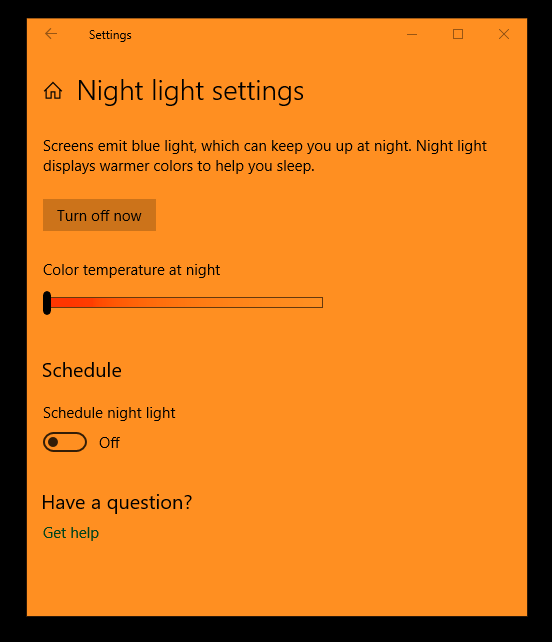 Night Light can also go to around 1200k of color temperature which removes most of the blue light but this may be ineffective if you want really improve your sleep. 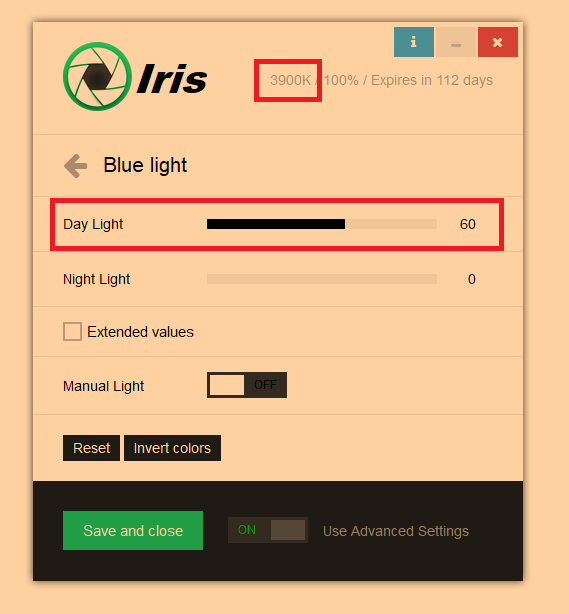 If you want more reduction that this Iris can go to 0% blue and green light. 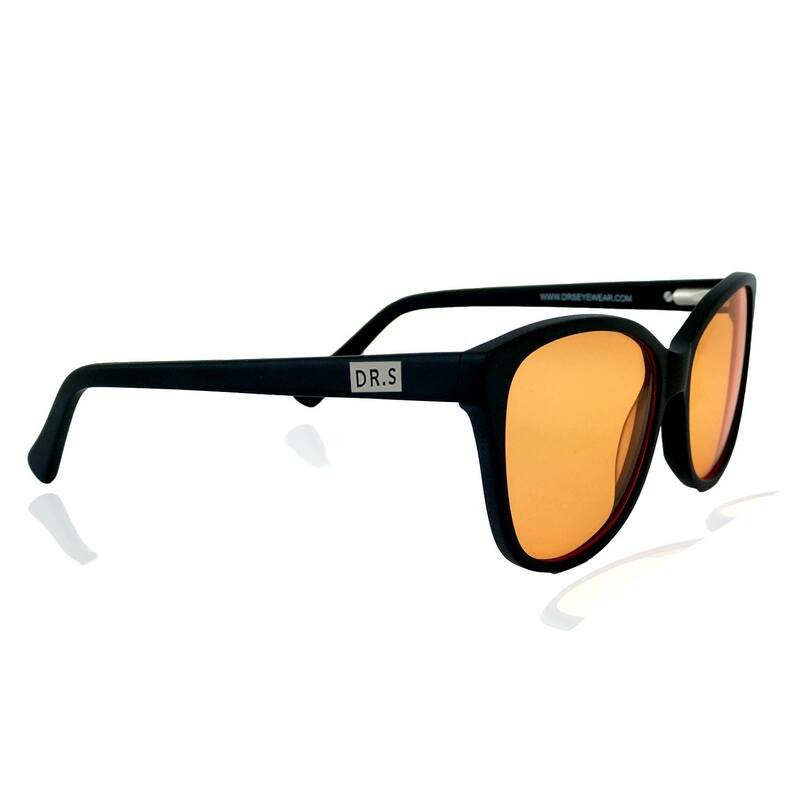 Otherwise, if you only need some eye protection going to 3400k will reduce the spikes of blue light and will be enough and not much orange or red. Something I don’t like about Night Light is that you can’t see the actual values of the color temperature anywhere. It would be nice if there was some kind of percentage but this is also not present. If you have some ruler you can calculate the kelvins via getting the length of the line and the position of the black slider then calculate the percentage. From there you need to know that the most right value is 6500K and the most left value is 1200K. 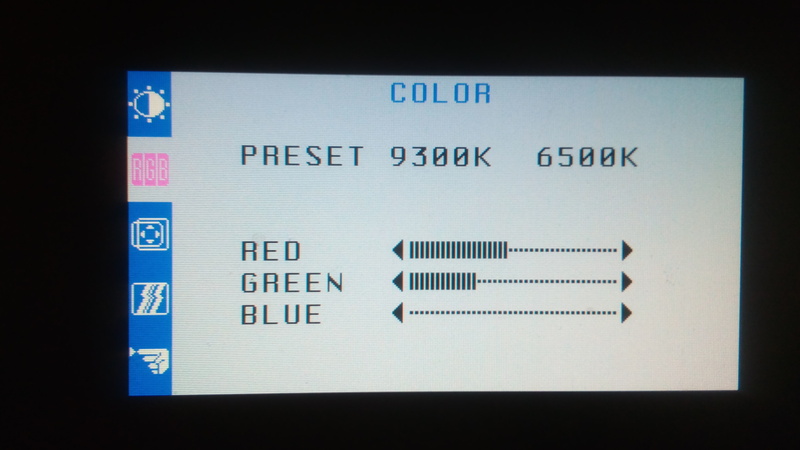 You can then calculate the color temperature of the screen. 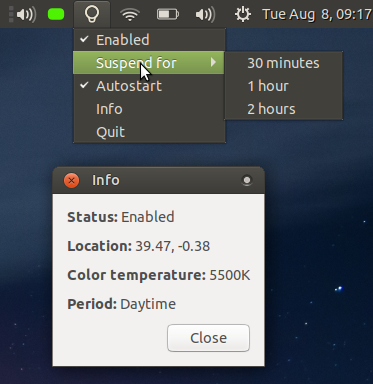 Another nice benefit of other third-party programs is that they show the current color temperature. Iris, for example, also shows the percentage of blue light blocked from the screen. Thank you for reading this whole massive article about blocking blue light from digital devices. I spend 3 months researching and creating it and I hope that I helped you to learn some new things. Fabulous research and the personalization of your testimony also. I’ve had migraine my whole life and challenges sleeping! I’d been using Yellow glasses for night driving as the eye strain from in coming cars. But knew the new stop and go signal lights have been Harsh! Knowing that they are LED and was grateful you alsi addressed the problems with LED. I’d noticed for years! As a healer and alternative Massage Therapist I’ve been preventative minded. But my budget is also a factor. Thank you forever for the devotion to this solution oriented articial. I’m praying someone as passionate as you will create and direct the arduous process of Lobbing protection for U.S.
i am a graphic designer and need a good Blue Light Blocking Glasses but without tinted lenses. My question is, maybe lenses with transparent lenses can block the blue light? like Spektrum Glasses or Boca Blu company Which claims thei rColorless lenses block harmful blue light. is it right??? Color lenses are not suitable for graphic design.what’s the solution??? but some of the manufactures lie so I’m not sure how you can test this. 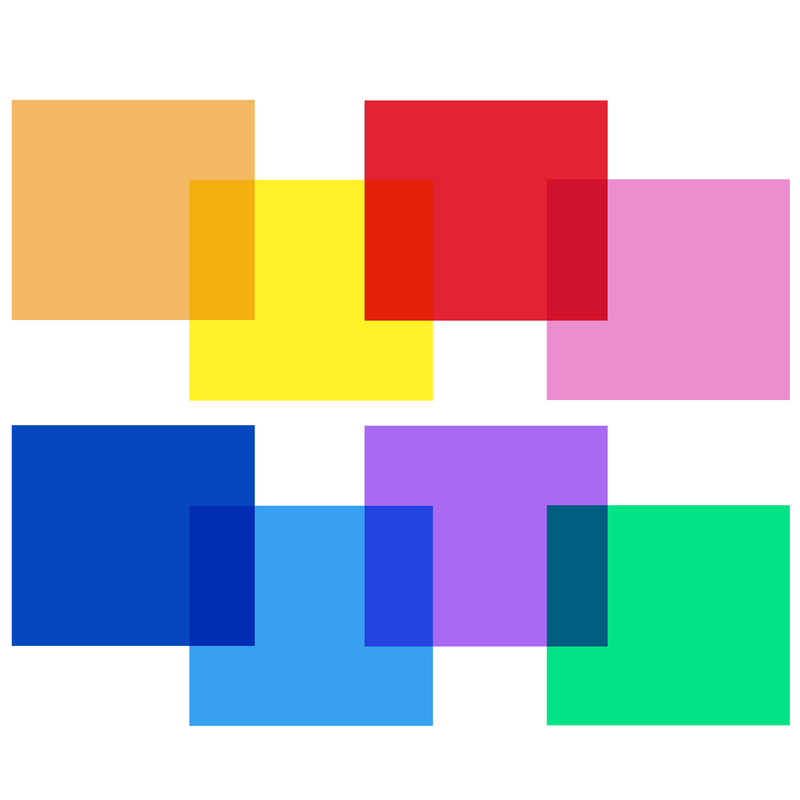 Basically, it’s impossible to block part of the spectrum without also changing the colors. In Iris, I made 2 solutions for this. One is to pause Iris when a program like Photoshop is running. 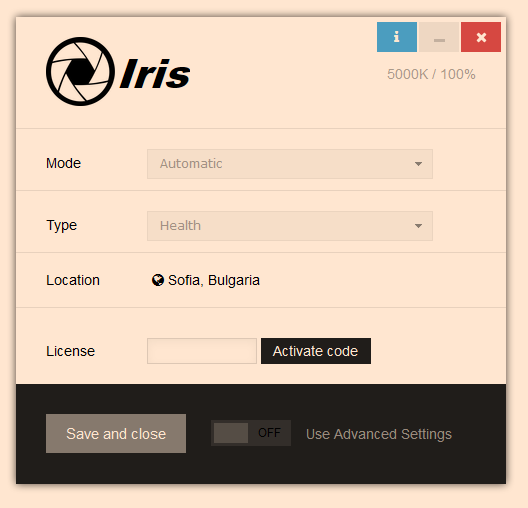 And in the last version of Iris it only disables when Photoshop is on focus or some other rule. You can try it with the free trial of 7 days Iris, no need to enter any debit/credit card details, etc. We can also give you a code if your trial is expired to test, etc. 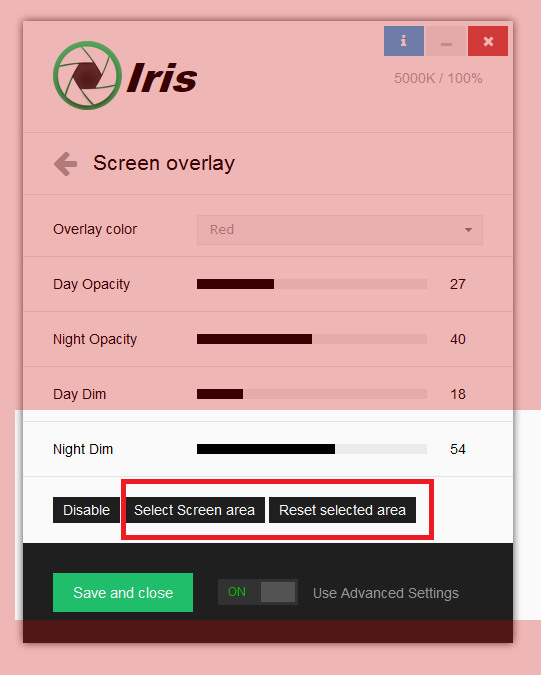 This is called Part screen overlay and Iris is the only program which does this at the moment.